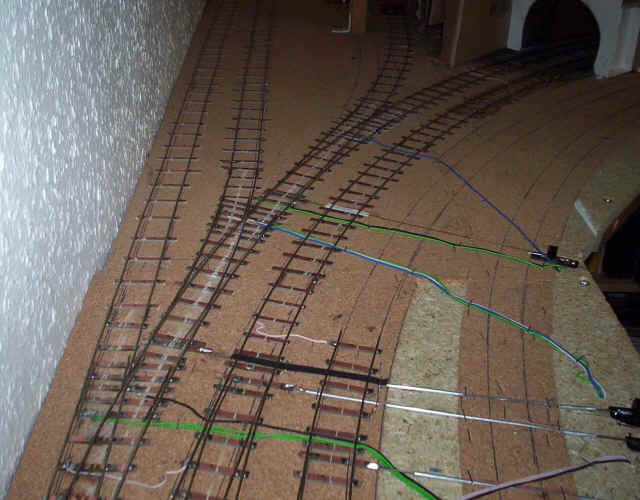 Over the Christmas 2003 I finally completed the track work for my first S Scale layout. Originally I had intended to use C&L chairs and had quite a lot of help from S Scale group members about this. I built a rather nice looking point using C&L components but found I had to wear my magnification visor all the time just to see the chairs. Since I last used C&L parts about fifteen years ago on my Irish layout my eyesight has clearly deteriorated considerably. By the time I'd completed the first point I realised I just couldn't face building track this way. Model making is supposed to be fun and wearing my Optivisor for hours on end is not my idea of enjoyment! Fortunately, I'd got a lot of PCB sleeper strip so it was back to the soldered method. To improve the appearance I've followed Ian Rice's (and no doubt others) suggestion of soldering the rail both on the outside and inside, thus giving an impression of chairs. After painting the track I'll follow John Sutton's (3mm Society Editor) idea of picking out each chair in a dark colour. carriage siding and a loco road. For freight there is a cramped three track yard with a kickback to a warehouse, at one of those dark satanic mills. I grew up in Lancashire, and later the West Riding of Yorkshire, so that is what I want the layout to represent. As the size of the layout is only 9 feet by 8 by 8 in a U shape, I decided to dispense with a platform run round crossover. It was either that, or curves down to less than 4 feet on the station approach. 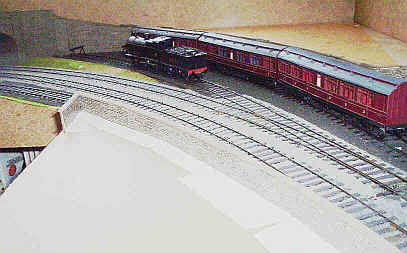 The freight train locos will run round their trains on the double track approach to the station. All passenger trains will be released by another locomotive or the stock will be propelled out of the station and the loco will then run round via the fiddle yard in the same way as the freights. This double track section is a bit of a cheat as the passenger trains will all run to the fiddle yard on the outer track, whilst the freights will use the inner track. I am presuming that the line is single track (or there is a crossover) after it passes under the bridge at the end of the scenic section of the layout. To give the impression of a larger station the tracks at the buffer stop ends will disappear under a curving road bridge. 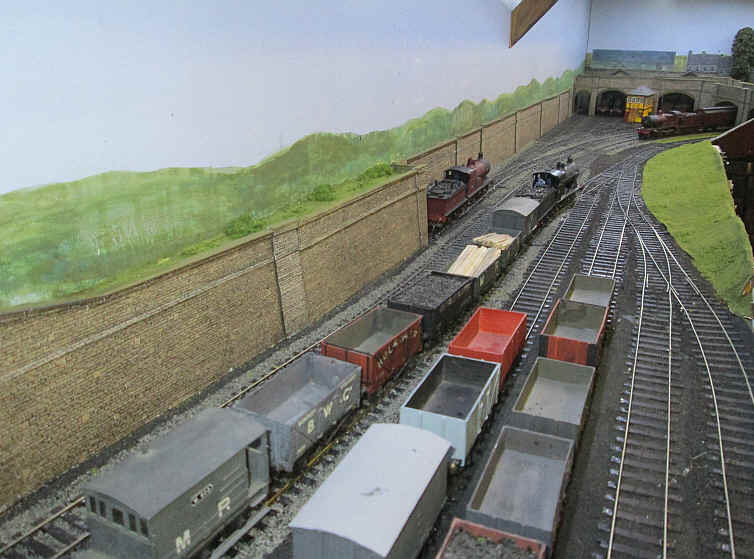 The fiddle yard uses the centre track for locomotive storage and can accommodate up to three locomotives. Passenger trains will be hauled by two 4-4-0s; a 453 and a 990 will be available. I shall have both locomotives facing in opposite directions. On arrival at the station behind, for example, the 453 the 990 will arrive tender first from the Halifax MR shed (fiddle yard in reality). After departure of the train, now headed by the 990, the 453 will run light engine back to the "shed". It will, of course, really run back into the centre road of the fiddle yard. Freight trains will be headed by either a 3F or 4F 0-6-0. Shunting will clearly be a complex (although from a modeller's perspective more interesting) due to the need to shunt the warehouse kick back siding and the fact that the only run round is on the curved station approach. Note the plan is not drawn strictly to scale. This first view shows the point work at the station approach. The siding on the left will be to a warehouse. Then there are the two main line tracks and behind are the locomotive and carriage sidings. The second view is looking towards the buffer stops. On the right are the two platform roads, with the three tracks for the small freight yard. The over bridge (seen in mock up form), together with the platform canopy will eventually disguise the shortness of the station. All that wiring and point control wires and tubes will be hidden under buildings. I have used card and Metcalfe embossed stone extensively as I feel that the Metcalfe stonework is very close to what I want to achieve; that is West Riding of Yorkshire millstone grit. Using this material has been an interesting change from my normal constructional methods based on embossed plasticard. I have an increasing dislike of using solvents and much prefer water based adhesives such as PVA. However, I have to admit that the results are not all I hoped for. There's a sameness about the card and its much more difficult to obtain that substantial look of retaining walls. I haven't completed all the detailing necessary on the walling as yet so things may improve. 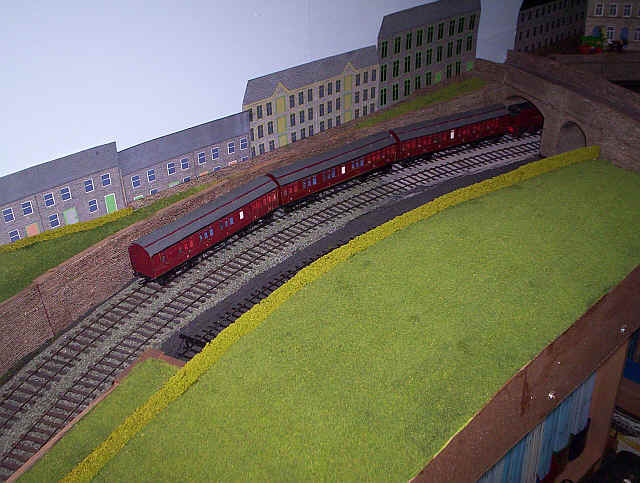 However, Halifax Midland is intended as only a quickie test layout so I'm not going to restart construction in plastic. The photos are annotated to indicate where I intend to place my mills and warehouses. Simple card mock-ups will be knocked-up shortly. I'm still undecided what to do about the bare hardboard that you can see above the retaining walls. I've put this there to protect the wallpaper - I don't want to have to repaper the room if I can avoid it when the layout is demolished. Should I leave the hardboard in its raw state, or varnish it, or paint it. What do you think? The station with the line "disappearing" under the road bridge. A station building inspired by Keighley will appear on the bridge in due course together with a platform canopy. The large flat area in the foreground will eventually house a weaving shed with a north light type roof. The 2P leaves Halifax Midland. 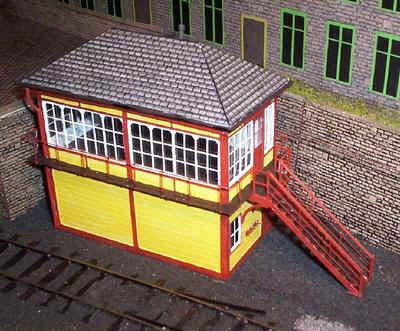 The MR signal box in this view is 4mm scale model from my old Wennington layout . Fortunately I was able buy an S Scale kit from Jim Guthrie which should make construction "easier". The carriage siding and loco road. Behind is a raised area for a large woollen mill complex. I think I'll be building this out of plasticard to avoid all stonework looking the same - or would it look better in Metcalf stone? Perhaps the different medium will simply clash. The road bridge; I've used this to break up the 180 degree curve. The road surface is Kibri setts (cobblestones) embossed card. The single track goes to the proposed warehouse. There's lots more work needed on the bridge to make it look respectable. The other side of the bridge . The single track will eventually have a covered warehouse of it. The tunnel leading to the rest of the Midland system i.e. 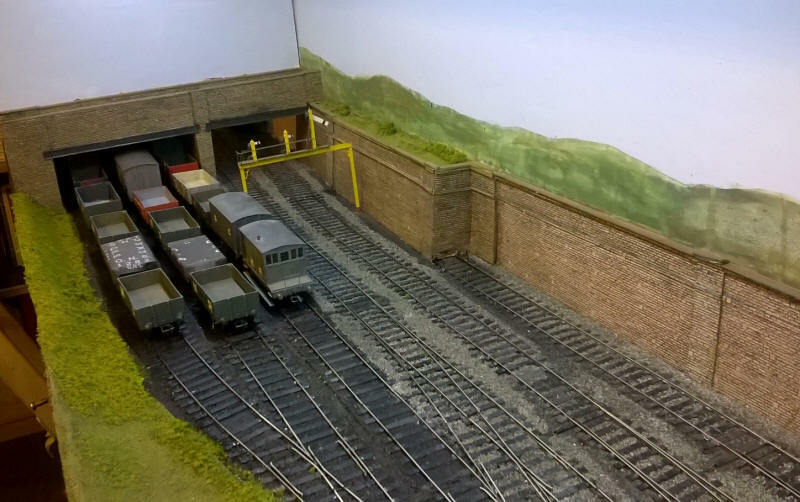 the storage sidings. Above the tunnel there will be yet another mill. 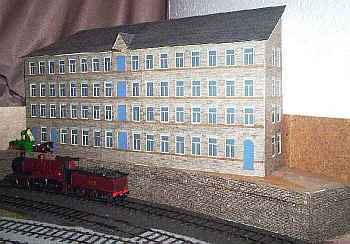 The first of the woollen mills intended for the layout. This is loosely based on the Victoria Mill complex in Shipley which I was able to photograph extensively courtesy of a helpful site manager. The mill is built entirely of card with "Superquick" sandstone paper for the wall surfaces. The window frames were drawn using Microsoft Paint and resized to fit the window apertures. A dark, bluish grey was chosen from the colour palette and the windows were simply printed out on glossy photographic paper. It's quick, easy and you get every window identical which is something I doubt I could achieve any other way. I became increasingly disgruntled by the existence of that raised flat area at the front of the layout where I had intended to put some terraced houses. Firstly, I had realised, after operating the layout, that buildings here would really get in the way of running trains, and more importantly, I realised I needed more siding space. The answer to this problem was simple: I ripped up the woodwork and low stone walls and replaced them with two long sidings. I feel that the station now has more of a feel of a town station. The point work to the new yard comes off the head shunt that will also have a warehouse at the end of it. The curved points here have a 60" radius on the outer leg and a horrendous 36" on the inner curve. Nevertheless, all my stock will run through it. 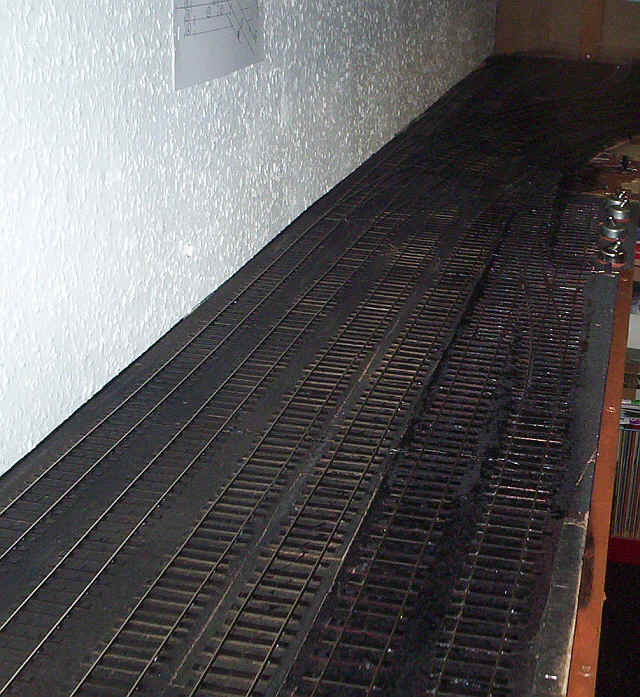 A continuous check rail has also been fitted to prevent derailments, and yes, it really does work. 1. The pair of curved points still to be ballasted. 2. 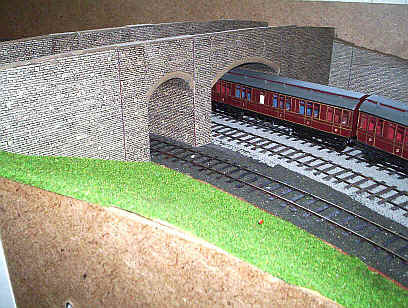 The new sidings already set in setts (cobblestones) using embossed card. 3.The greater width of the station track work gives a slightly more important feel to the station. One of the problems with such a constrained site, such as I have, is giving the impression that the layout actually has a setting. I obviously want to give the impression that the layout is based in the industrial West Riding of Yorkshire. 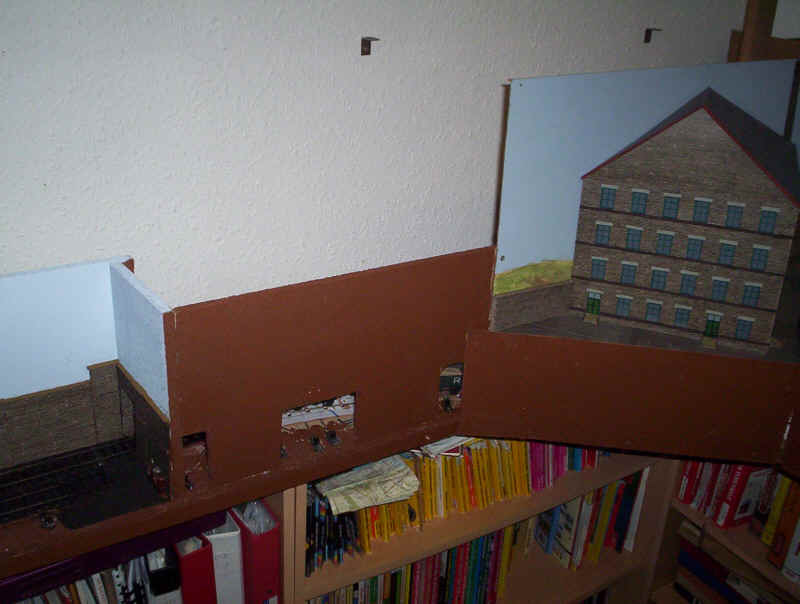 I therefore decided to attempt to construct a back scene using my computer to produce "flats" of mills and terraced houses. I'm not really sure that what I've managed to produce is quite what I'd hoped for but it's a start. The mills in Halifax are principally stone but there are some near the station that are brick, so I've included one of these. I feel that the stone work isn't really dark enough, so perhaps some washes of water colour paint will be needed to tone down the colours. To produce the buildings I scanned stone paper from Metcalfe Models and Superquick. This produces a background onto which the windows and doors are superimposed. I "draw" the windows and doors using "Paint" which is one of the accessories in the Windows package of programs. I then crop and resize the window or doors and copy and paste them onto the stone image. The great thing about this method is that you can have as many identical windows as you want all for the click of the mouse. When satisfied with the resulting image I resize the final result to the size I want and print it out. This is then trimmed to size and glued to the back scene board. The signal box is an etched brass kit and was largely soldered together. I decided not to use the complex etched tiles as I built the 4mm version of this box and hated the construction of the roof. In the end I opted to use Metcalfe Models slate cardboard; it blends in better with the existing structures and back scene. I've also become concerned that my plans for the end of the layout, by the goods yard head shunt weren't working out as hoped. Originally I'd planned to erect a warehouse here based on the one at Bingley. However, when I constructed a mock up the structure dominated the layout and hid the trains running into the station. As I find this particularly satisfying to watch I decided to scrap the warehouse concept and start work on a municipal park. So far all that's happened is the construction of a rolling grassy parkland with a hedge hiding the drop over a retaining wall on to the track. 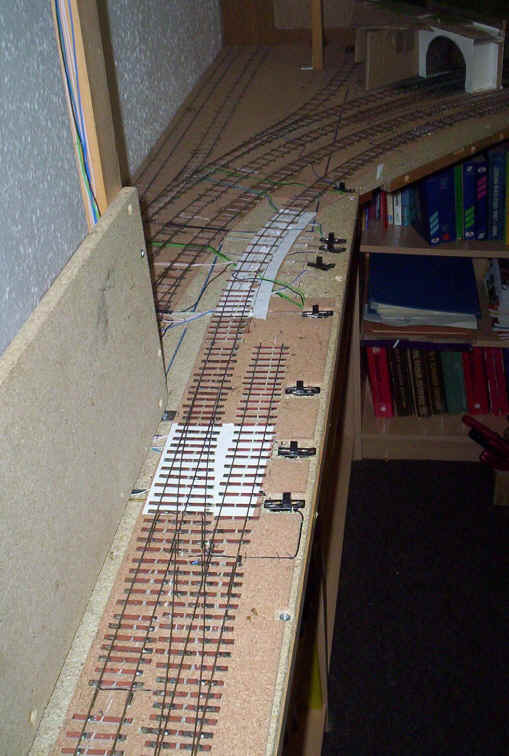 I also had to rip up the track on the head shunt and position it closer to the main running lines. The photo shows the changes. The buildings on the back scene still lack mill chimneys and chimney stacks on the terraces. All in all it looks, I feel, a lot better than the original plan. Space for a station building is extremely limited. I decided, in the end, to build it as a another computer generated "flat", as if it were on the back scene. However I gave it a little depth of about 5mm. 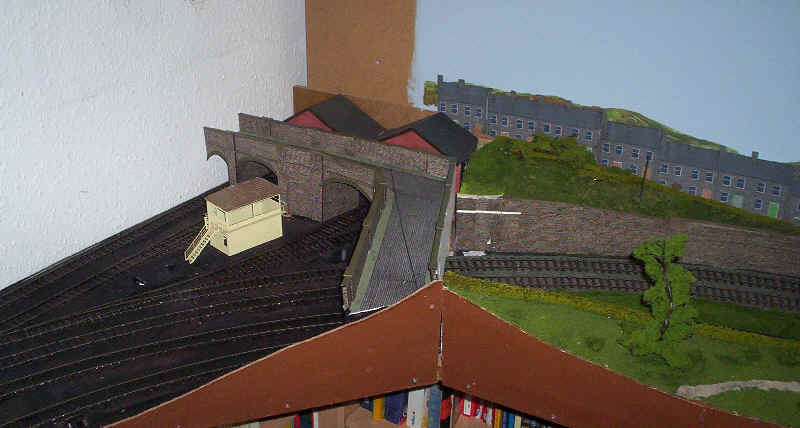 The canopy is based loosely on that at Keighley and is built entirely out of card and micro strip. The "glass" is simply a dark grey paint. 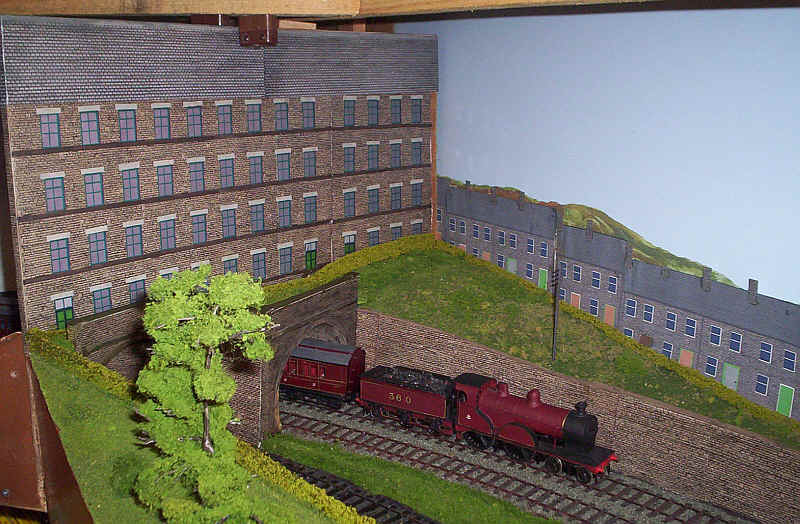 It's very simple and completely in keeping with the very understated nature of all the scenery on the layout. I was determined to complete the basic scenery and buildings during the summer holiday before re-launching myself into the lunacy that is 21st century primary school teaching! And is you don't know what I mean read about PPA time. On returning from a holiday in Switzerland I built the final large structure, the large mill over the tunnel mouth. The back scene is now largely complete although I'm not happy with the way the roads disappear. Lots of small details such as bushes, notices, name boards, people, road vehicles etc. need to be added. Of course, everywhere is to clean for the 1920s West Riding so some experimentation will be needed before I "dirty" everything. As will be obvious from the text and photos the layout has evolved from the original plan. The sketch plan below is what, I expect, will be the final arrangement of track and scenery. 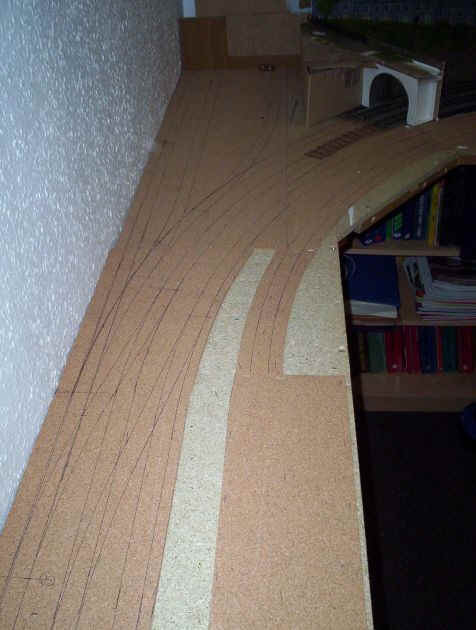 Construction was virtually over by early 2006 when I discussed the possibility of the layout being featured in "Railway Modeller" with the editor John Brewer. As usual, he was delighted to do so and sent that photographic expert Steve Flint to take the necessary photos. To my delight the layout was "Railway of the Month" in the June 2006 issue. A period of manic detailing ensured before Steve duly arrived during the Easter holidays. To see Steve Flint's superb photos click on this link. There comes a point in the lives of most layouts when you realise that the layout is saturated with rolling stock and there's nowhere to put the latest models. That was the situation I'd reached in early 2007. The rake of clerestory express coaches I've been building is virtually complete; the problem I've got is two fold. Firstly, there's nowhere to put all the passenger vehicles on the layout at the same time and, secondly, the main passenger line in the fiddle yard is slightly too short for the longer 54' vehicles. It was designed to hold a rake of three 48' coaches and a loco. 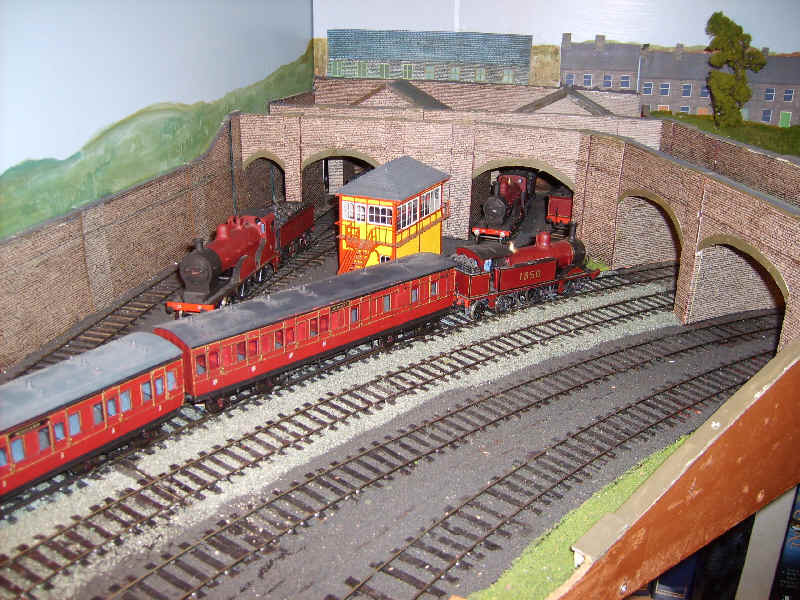 I also would like to have the scenery run right round the layout as I like the feeling of being enclosed in the layout that exists on two sides of the room. One feature I've never really reconciled myself to is the need for wrong line running on the double track station approach. The solution appeared to be a major rebuild of the third side of the room. 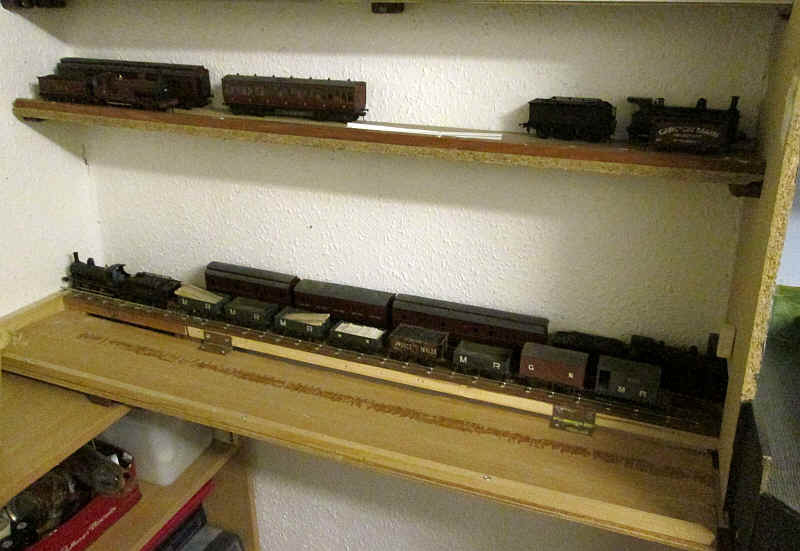 I've replaced the existing fiddle yard board by one about three inches wider and totally redesigned the fiddle yard. 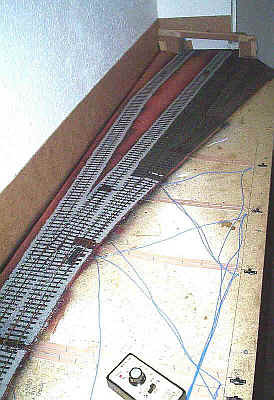 The photos show the track layout drawn out full size on cork. In future passenger trains will be able to run "right road" in both directions into a single track at the rear of the fiddle yard. 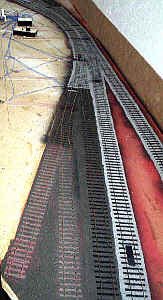 There will be three kickback sidings off the line leading to the station. These are both capable of holding three coach trains. I will probably propel trains into these sidings between workings, or maybe just "finger tip" shunt them manually. The third siding will hold two passenger locos. Freight trains will now approach Halifax on their own dedicated freight line. If I decide to use the train loco to shunt the wagons it will run around its train "right road" by running back to the fiddle yard and then return along the freight line. In my imagination the tunnel is short and the crossover to the freight line is just beyond the tunnel. 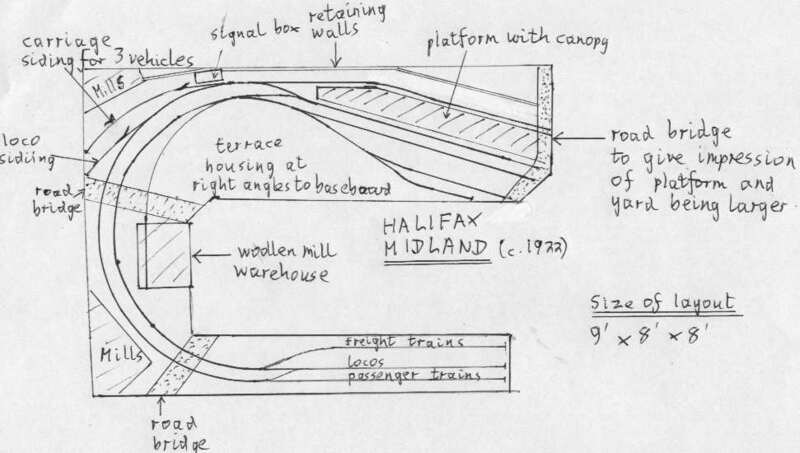 To add further operational interest and , perhaps more importantly, I've also decided a freight branch to Halifax's Midland Railway warehouse. This line leaves the freight approach line just before the tunnel and heads off round a tight curve to a yard with a couple of sidings. One of these will disappear in to the warehouse, which will be a condensed and half relief replica of the one that still stands at Bingley. Learning from experience all point-work on the layout will have a minimum radius of 48". The main line will also be of the same radius, whilst the freight lines will be down to 36"; this is no problem to any of the 0-6-0s I have. The new freight lines replace the head shunt and park area. 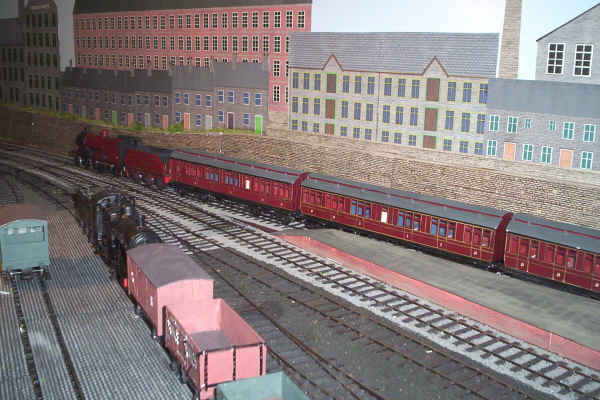 The left hand line runs from the fiddle yard, whilst the right hand leads to the warehouse. The fiddle yard pointwork is seen in this view. The passenger trains will use the left hand road after running "right road" from Halifax Midland. In the distance can be seen the two carriage sidings and the loco road. Freight trains will use the two tracks on the right. 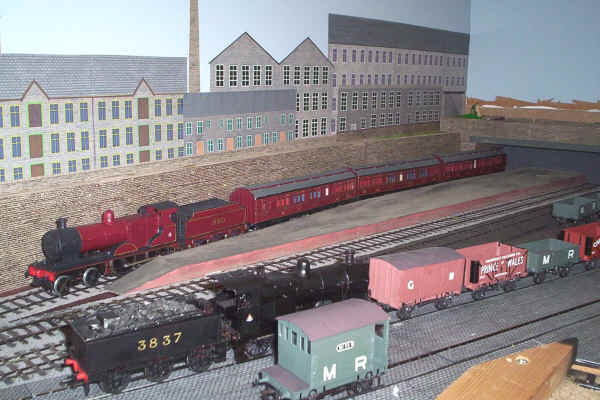 At the front of the layout the approach line to the warehouse can be seen. I'd not drawn in the track on the front part of the layout where the warehouse will be when I took the photo. The bare chipboard between the cork sheets is where the back scene will be. I'll be able to look over this to uncouple locomotives perfectly easily. I've decided not to have a canal wharf at the front part of the layout after all; there is simply not enough room. 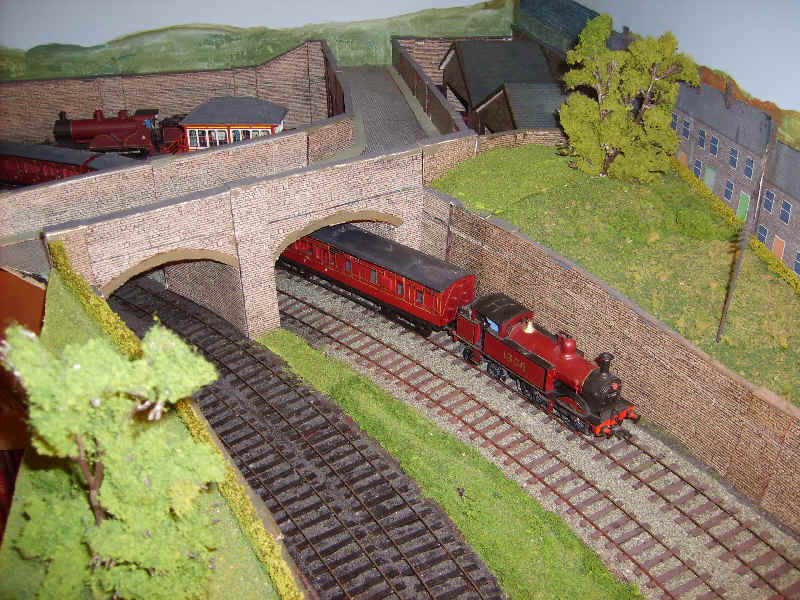 1) Passenger trains - trains will now arrive from Halifax station running correct road and access the passenger road in the fiddle yard by using the crossover on the left. There are two kick back carriage sidings which can be seen in the distance. One will hold a rake of three 54 foot coaches, the other three 48 footers. 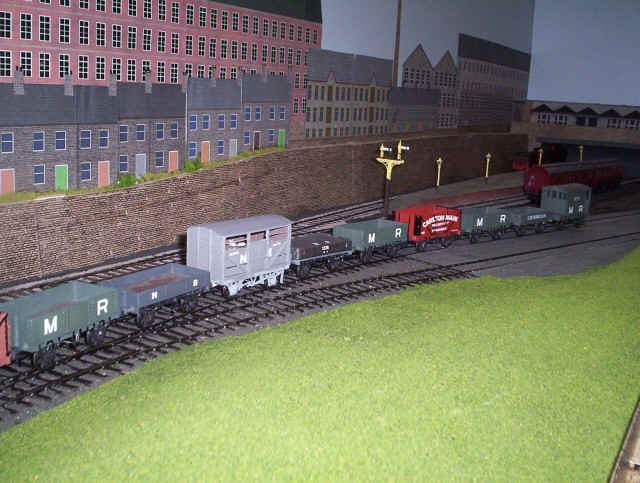 2) The centre road can be used in two ways - to store up to three locomotives or as a line for freight trains. 3) Freight trains will normally use the right track. After arrival the wagons will be removed to a storage shelf above the fiddle yard. The freight trains will use the new curve which so far exists only as pencil lines. The support in the picture is one of the legs that support a shelf above the layout. 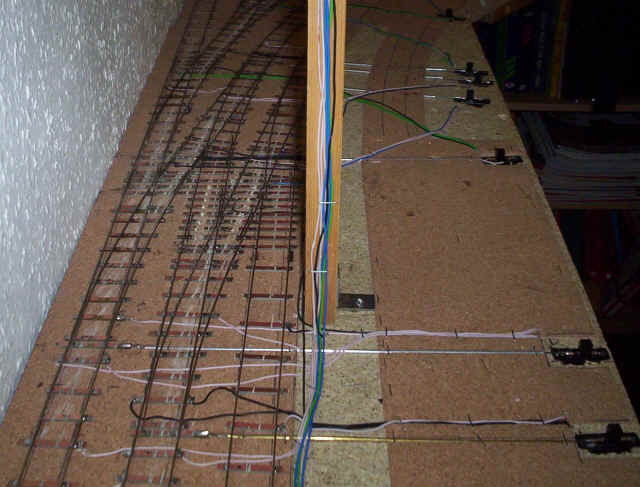 The wires running down it run from some switches used to isolate the dead end sections in the fiddle yard. Point control is piano wire in brass/ aluminum tube with the wire passing through a hole drilled in the knob of a double pole changeover slide switch. A short length of brass tube is soldered onto the piano wire either side of the knob to control the distance the wire throws the point blades. Electricity is fed to the common crossing of the point via the terminals of the switch. The worst part of installing the switches is cutting a hole in the chipboard. I use a "big drill" to make a very rough hole with all wiring being on top of the board due to the nature of the baseboard (see earlier for explanation). The focus of the track-laying now switched to the freight lines. 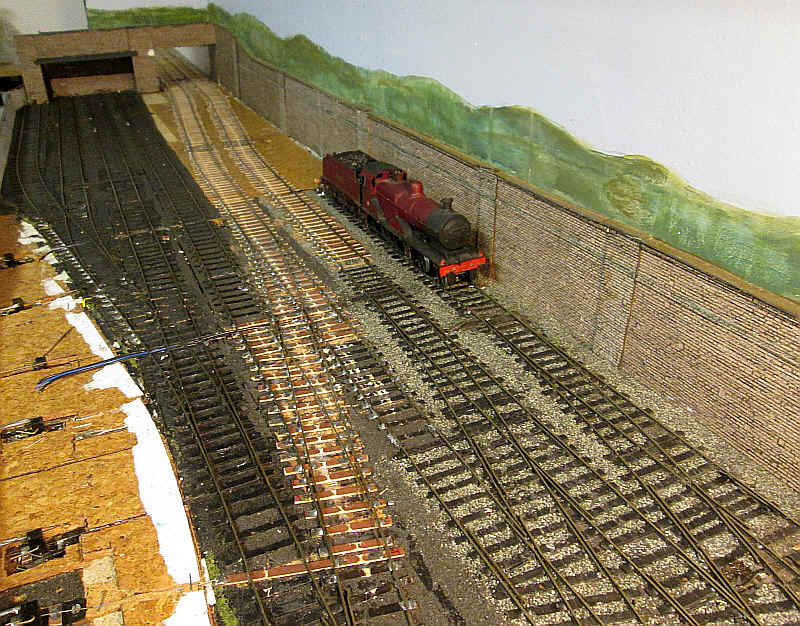 In the photo below the original freight yard head shunt has been lifted and replaced with a separate goods arrival line from the right hand line in the fiddle yard. 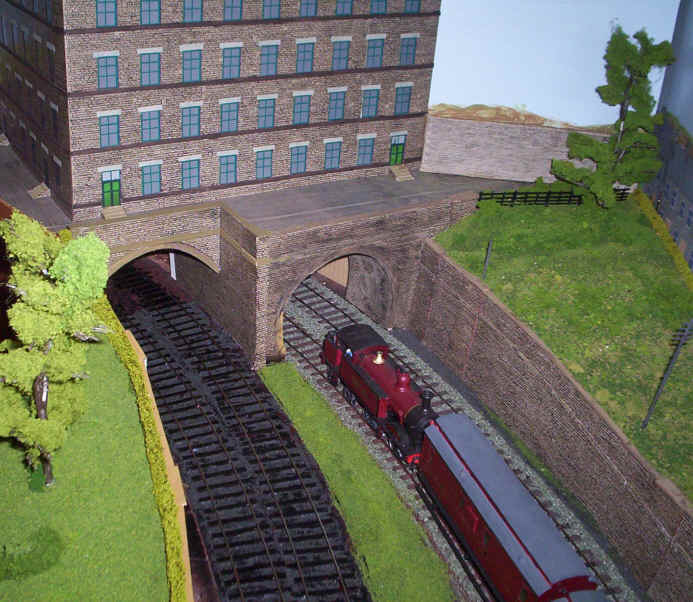 This will appear out of a second tunnel; one is asked to imagine that this line is linked to the main line just the other side of the short tunnel under the mill that will reappear in this corner of the layout. 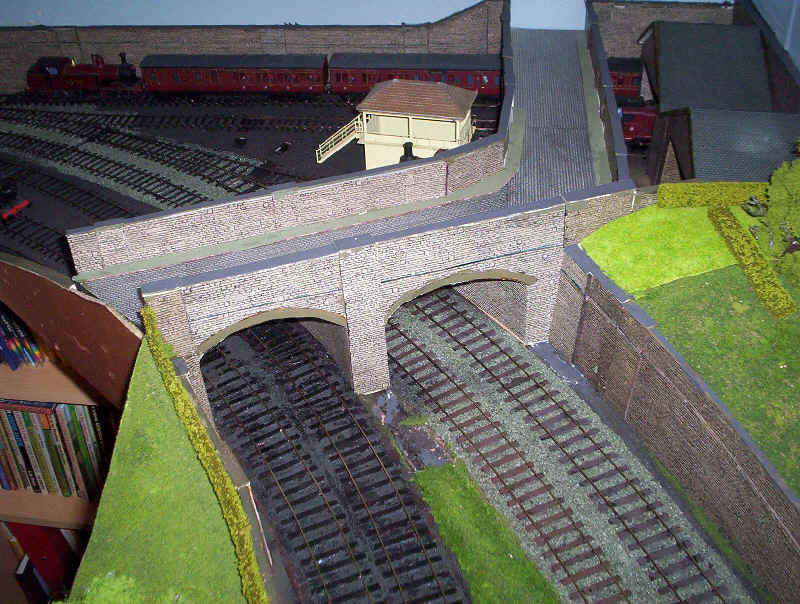 The point that can be seen in the photo is the junction for the short branch to the new goods warehouse that will stand in front of the fiddle yard. The curves here are a flange squealing 36" radius. Luckily my 0-6-0s seem quite happy on the curves. The two views below show the track for the warehouse branch. In the photo on the right the two tracks appearing in front of the tunnel mouth link to the junction in the photo above. Trains will be propelled through the short tunnel into the two warehouse tracks; no doubt this wouldn't have been allowed to happen in real life but there really isn't enough room for a run round loop so I'm simply going to break the rules! 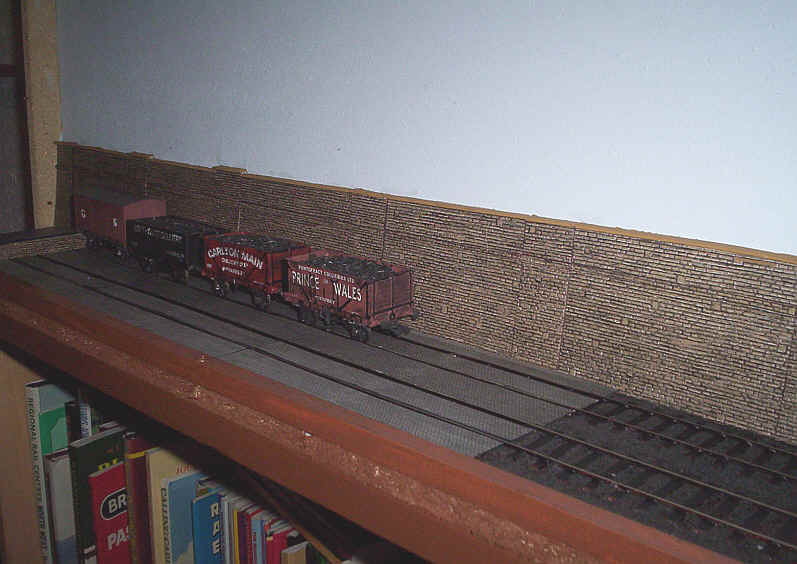 The two points on this part of the layout have been salvaged from the original fiddle yard. Just a few extra sleepers were needed to make them visually acceptable. The point leading to the kick back siding is actually a dummy; the siding will have an end loading dock with a wagon parked on it permanently. 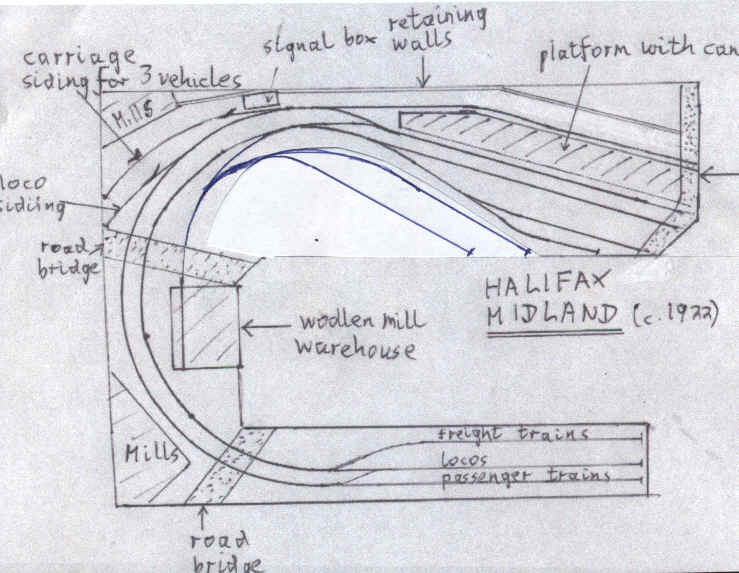 A revised track plan of, I hope, the final layout of Halifax Midland. I don't think there's anyway I can amend the layout any further in the space available! The photos below show the rebuilt tunnel mouths under the mill. I wonder whether a building as large as this would actually have been built here but it certainly looks dramatic. The photo, of course, shows up the lack of tunnel lining! The park has reappeared on the left of the photo, slightly reduced in size. 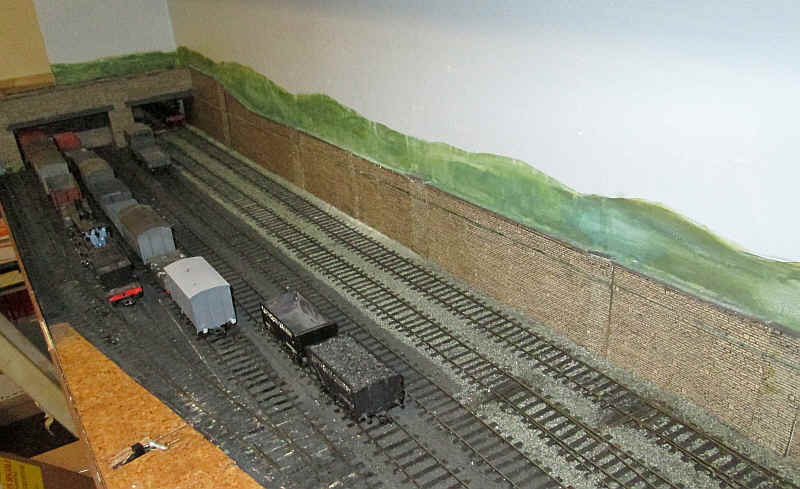 The two photos below show the first stages in the development of the small freight area in front of the fiddle yard. 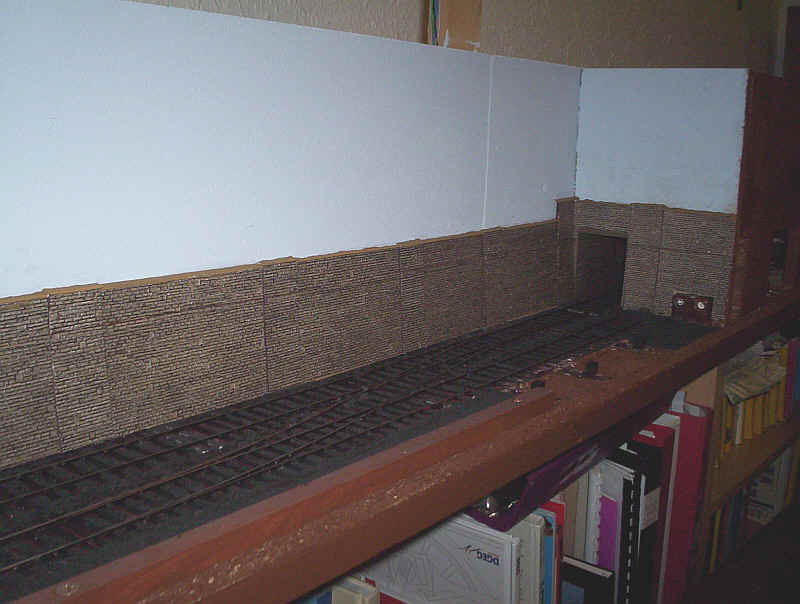 The retaining wall uses Metcalfe Models stone cardboard to match with the rest of the layout. Eventually, when my printer gets a new colour cartridge, I'll print out some more "building flats" to go on the back scene board. A few more mills and terraced houses should help to create the impression of a yard located in the outskirts of Halifax. I was going to build a warehouse where the "setts" or cobblestones are ( Metcalfe Models N Scale slate tiling!!) but I'm not sure there's really enough space. Possibly a simple mock-up will convince me one way or the other. 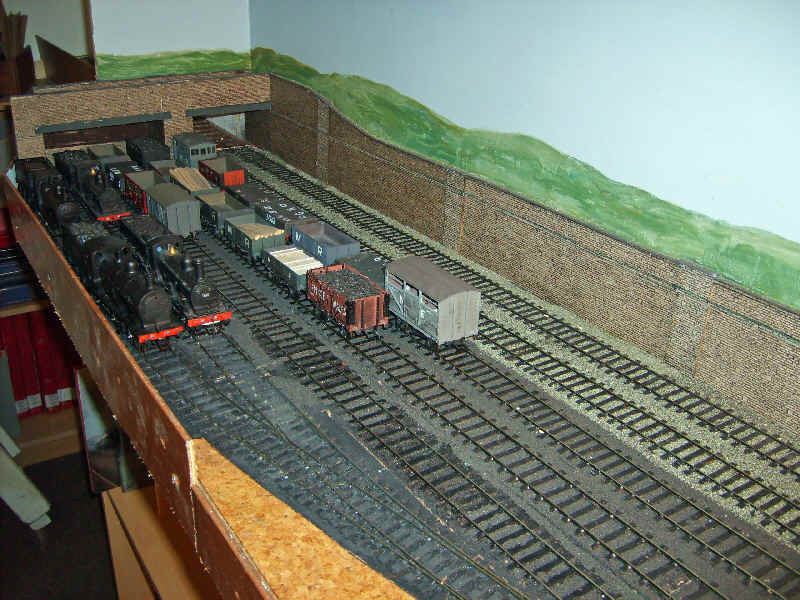 The photo below shows the short "non scenic" area between the main layout and the new freight yard. It's only about a foot long which means I've almost achieved my aim of having the scenery right round the layout. I felt it was more important to have a clear access to the complex of track in this area. The holes give access to the slide switches controlling the points. I wasn't very happy with the plain "sky" behind the new siding area but my initial experiments with "buildings" printed on my computer didn't convince me. 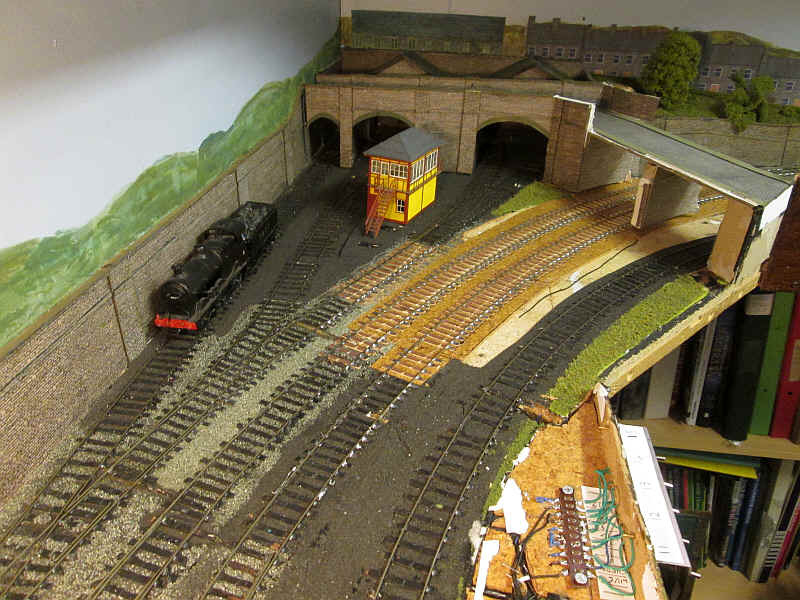 The problem seemed to be related to the height of the back scene board, which is considerably lower than on the rest of the layout so as to allow access to the fiddle yard. In the end my wife, Fran, suggested that I just paint the Pennine hills in water colours and leave it at that. The transformation was remarkable but I still felt that it was wrong. 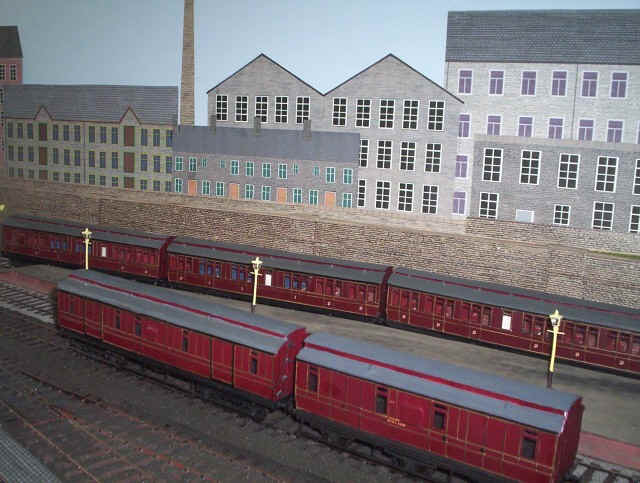 The back scene now looked more like the northern Pennines - great for the Settle and Carlisle but not quite right for the industrial West Riding. Anyway, the next morning inspiration dawned as I looked at the hills. Why not imagine that the yard is well above the valley floor. After all it is at the end of a freight only branch so it could well have been located above the town. I've imagined that the yard is located just before the crest of a ridge of the hill. This will explain why there's a retaining wall. As we are, of course, looking down from a helicopter we can see over the retaining wall and into the valley beyond. First I printed out about half a dozen rows of terraced houses and glued these just above the retaining wall but with only the top floor visible. This gives the impression that they are further down the hillside. To complete the illusion I found some photos of real life Halifax mills and churches and positioned these to look as though they are further down in the valley. To mask the transition between the retaining wall and the flat back scene I've simply glued some Woodlands Scenics foliage clumps onto the top of the wall. No doubt the Midland Railway's engineers would have had a fit allowing so much vegetation near their walls but it is effective in disguising the 3D to 2D modelling. I have, reluctantly, come to the conclusion that there isn't room for any large structures on this part of the layout, even in low relief, so there will be no warehouse after all. Anyway, this concludes, more or less, the rebuilding of the layout. There are, obviously, numerous small details to be added such as figures, notices and a few huts. I can now have three rakes of three coach passenger trains, a parcels train and round about thirty wagons on the layout . There's also room for all my locomotives plus one or two more that are still to be built. One that is clearly going to be needed is a half cab 0-6-0T as I'm sure Halifax shed would have had one to do the shunting in the yards. Another 4-4-0, possibly a round topped firebox locomotive is also likely to appear. With the construction of more and more rolling stock, especially carriages, operation of the layout, particularly in the station area, has become more difficult. It was clear that more platforms were needed. I'd discovered that I rarely used the three sidings by the side of the platforms. The long road, which goes under the bridge, was useful to store spare carriages but the two short sidings were virtually unused in everyday operation. The solution was a simple one; convert this area into further platforms. Thus I lifted the track for the centre siding and removed all but the straight stock rail of the point. 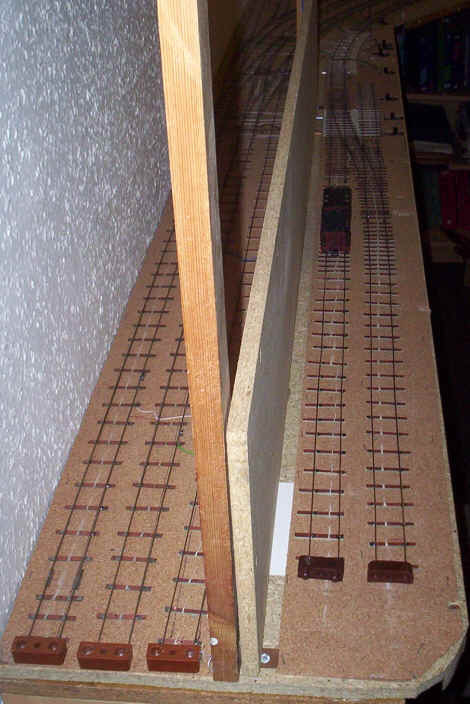 A new length of straight rail, closing the gap, was soldered in place to form a longer siding. As can be seen in the photo below this gives two new platform lines, one capable of holding a loco and three passenger coaches, whilst the other one will hold a parcels train. I'll need to alter the bridge to allow the platform to continue underneath it and I think the V shape of the platform will be visually appealing. Operation of the new four platform arrangements will be more interesting. The left side of the existing platform will be for arrivals only. The right hand side can be used by both arriving and departing services. The new platforms will only be used by departing services. There will clearly be plenty of scope for shunting carriages and I suspect I shall need to build a 0-6-0 shunting loco soon. 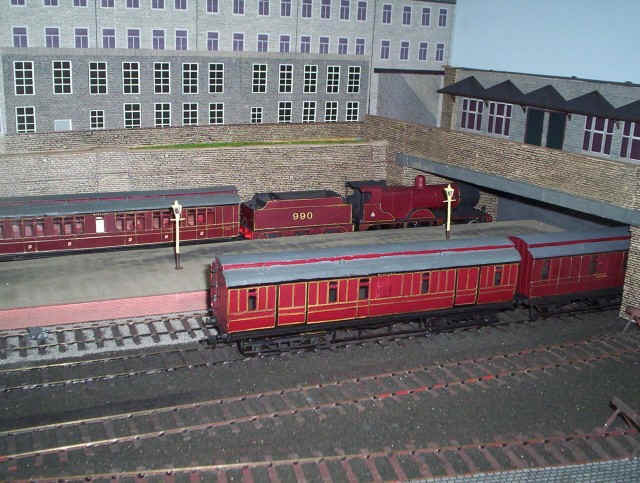 The latest rake of coaches, a three coach set of suburban coaches using Worsley Works sides stands in what will be platform 3 of Halifax Midland. The new platforms nos. 3 and 4, which give the station a more credible appearance, I feel, to the Midland's Halifax terminus. It's a pity the platforms can't be longer than three coaches but at least there's something of a main line feel about the layout. I had thought that the alterations in the fiddle yard would be the end of new track work on the layout but it has become obvious during operation that an additional "spot" for storing passenger trains would be useful, especially since I've plans to build more models. 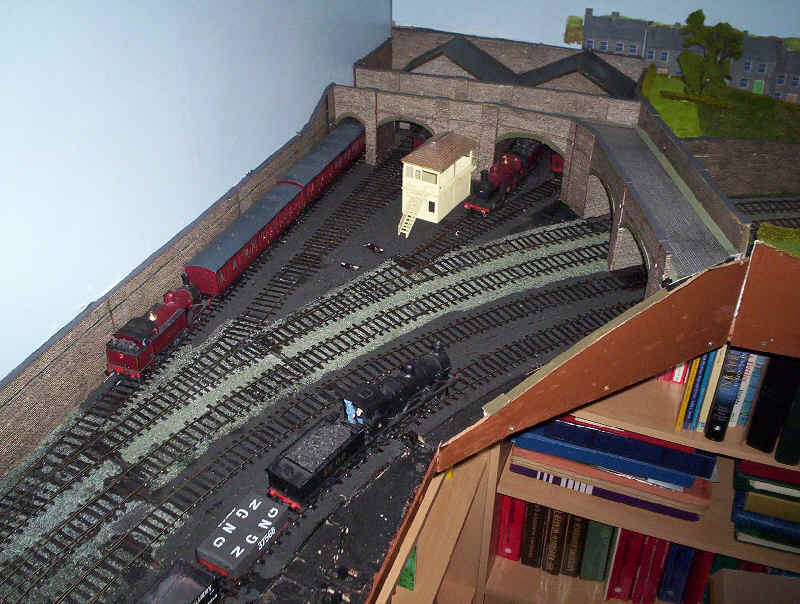 I eventually realised that by moving a item of furniture, a shelf unit, it would be possible to extend the rear siding in the fiddle yard along the wall and squeezed in between the unit and the wall. A couple of hours work saw this carried out. 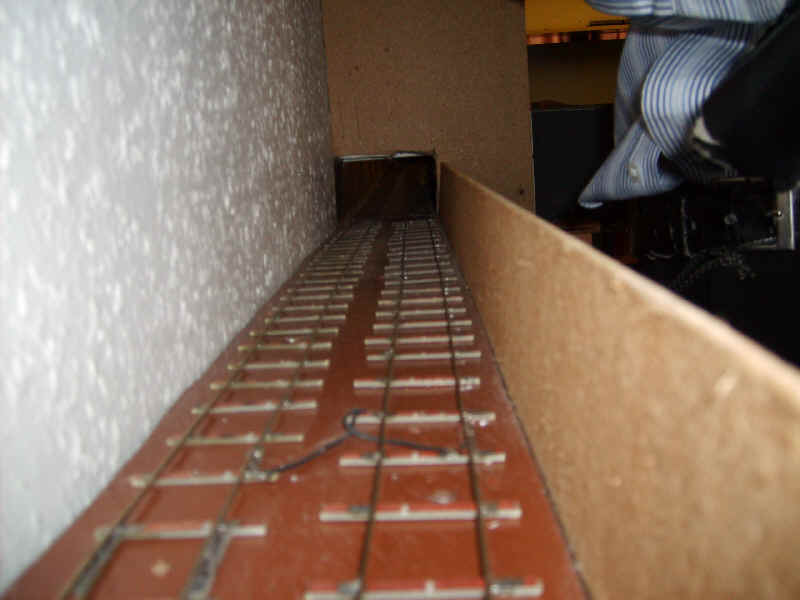 I cut a hole in the end chipboard wall of the fiddle yard and then screwed a piece of "two by one" timber to the wall of the room, giving me a length just long to hold a three coach train and a loco. A piece of hardboard protects the train from knocks but allows access for uncoupling. It's now possible to hold four passenger trains in the fiddle yard, although in this case the last train "in" will have to be the first train "out". With three trains it's possible to choose any of them to be the next "out". The latest track plan showing alterations to the fiddle yard. On the left there are now two carriage sidings (5 and 6) together with three short sidings for locomotives - one of these is accessed from carriage siding 5 whilst there are now two loco sidings at 4. On the right is the new extension shown in the photo. The photos below are recent images taken in August 2009. Clicking on the image will show the original large photo. Not altogether to my surprise, Halifax is going through another of its convulsions and another stage in rebuilding has just been started. It's all the fault of those BR London Midland Region models I've started to build. Whilst initially I thought I'd just run them on Halifax there is one problem with this that is simply insoluble. 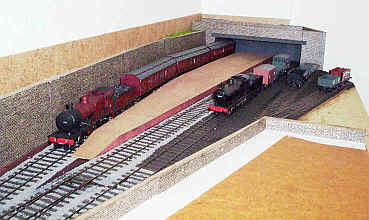 The platforms are two short to take three Stanier coaches and a locomotive. The solution to this is to build another layout for these (and future) models. Initial thoughts turned to using the loft but a few hours spent up there measuring up left me, once again, with a very uncomfortable back. Sadly, the headroom in the loft doesn't allow me to stand fully and the prospect of repeated back problems doesn't appeal. The only location, at present, for a new layout is above Halifax Midland so I've now built a U shaped baseboard suspended from the walls ready for this. The knock on effect, however, of this was that I'd no longer be able to look over the back scene into the fiddle yard, as there is not enough headroom between the two levels of baseboards. Therefore I've decided to rebuild the fiddle yard area and give it a basic scenic treatment as a carriage siding/ sorting sidings/ locomotive valeting area. There seems to be a trend, these days, into making fiddle yards more scenic. One good thing about all this is that there's now room for another road in the fiddle yard for more trains; in this case it's long enough to accommodate another freight train. Originally, the fiddle yard was built with sleepers only in every third position. I've therefore inserted the rest and sprayed the track area black. 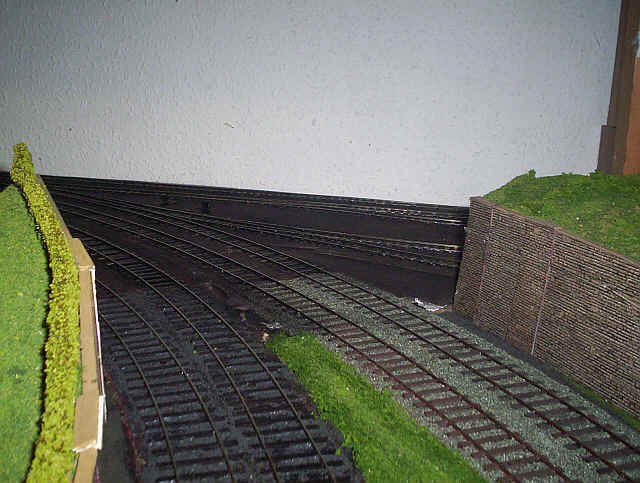 In the not too distant future, I intend to ballast the track, add some retaining walls and a back scene. All this has, unfortunately meant the destruction of the area at the entrance to the two tunnels, which was my favourite view on the layout. However, I intend to build something similar to disguise the transition from the Halifax "real" station to the storage area. 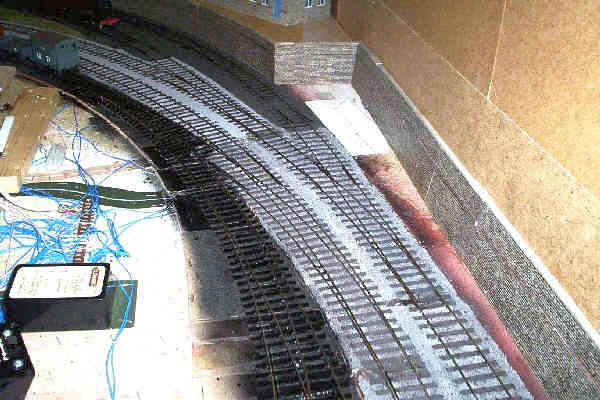 The photos show the track ready to accept their first trains. Somehow I've got to come up with a satisfactory solution to disguise the exit from Halifax. The current position if on the left with the previous one on the right. I, at first, wasn't quite sure how I'd arrange the exit from the scenic section of Halifax Midland . Various thoughts ranged from simply running straight into the fiddle yard with no scenic break or having a bridge. However, I've always liked the tunnel with the mill over it as this, to me, reminds me of several places in west Yorkshire. In the end it occurred to me that by reducing the 3D mill to its basic components I could use it as a flat on the back scene. The tunnel mouths from the original scene were also re-used, slightly modified. 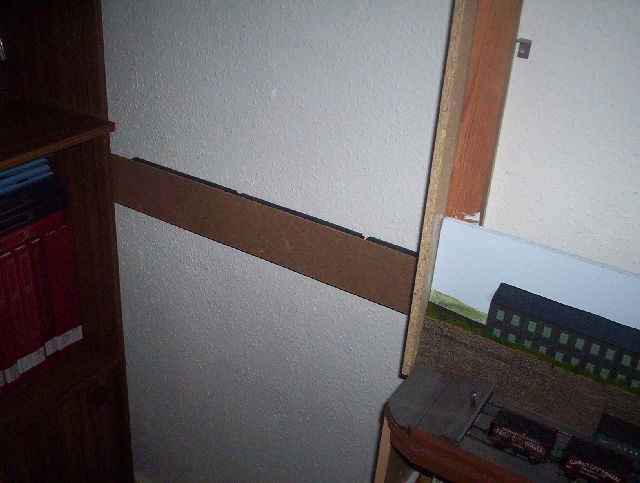 The result can be seen below, with the timbers of the new baseboards encroaching into the scene. The photo reveals that the mill isn't quite finished; a few downspouts will hide the joints and some guttering is needed. A tree can disguise the corner joint. Overall, whilst not quite as good as the original scene I'm reasonably pleased with the result. Having, more or less, completed the changes to the scenery on the Halifax side of the layout I've turned my attention to the fiddle yard area, which is to be given a scenic treatment. 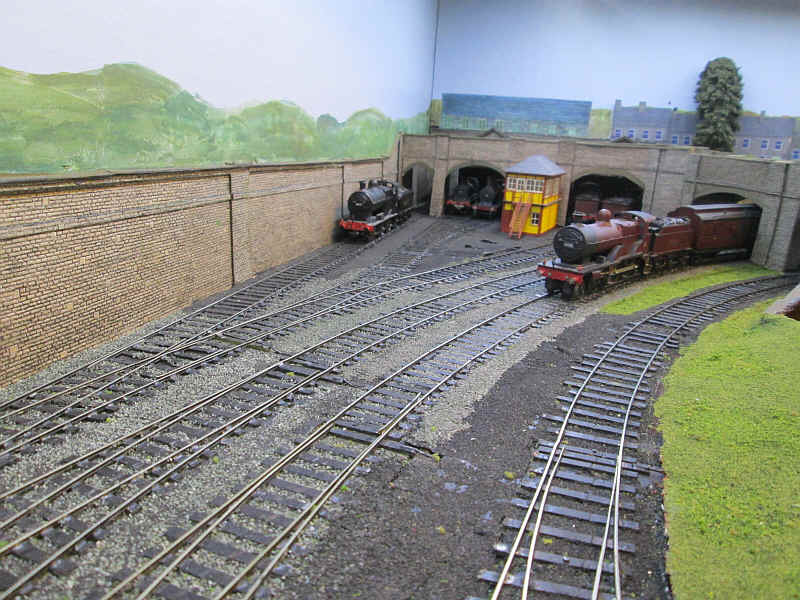 Quite clearly, the fiddle yard track layout bears no resemblance to what would be permitted on the real railway. The locomotive storage area leads directly off the main line for instance. I can imagine what the Board of Trade would have had to say about this should the Midland railway have tried something similar. 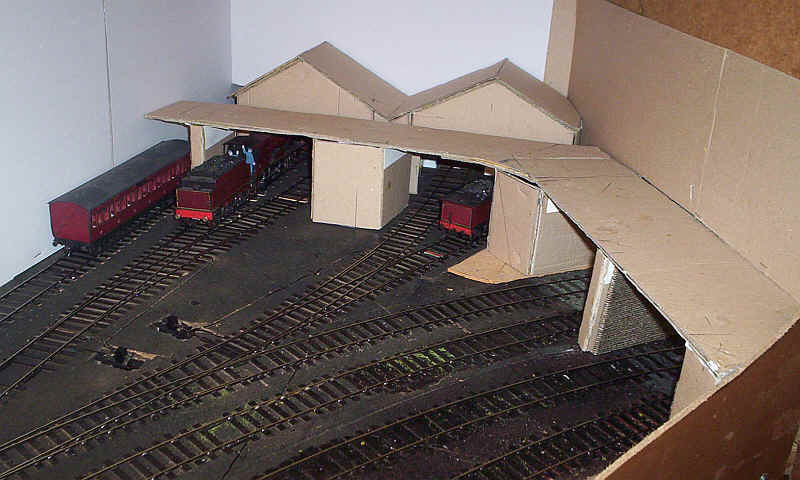 No matter, the point of the scenic treatment of the fiddle yard is to give it a more attractive and interesting appearance and to allow me to view my models in a more realistic setting. The purists can jump off the cliffs at Saltburn if they wish! 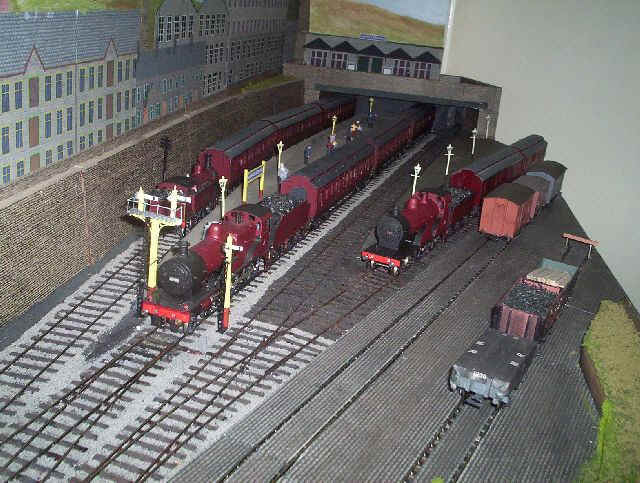 Anyway, it's nice to see other members of the S Scale Model Railway Society having an input into my layout and so I was pleased to receive an email from Simon Dunkley with this suggestion. "As for the scenic break, I would put a road over, but have the road making a (LH based on going away from the operating well) turn and also passing over your loco holding roads. You could then put a false front of a shed against the wall, to make it look like this was part of a larger complex, and the road would help disguise the fact that this was just a scenic flat." I'd also wondered about this method of treating the corner, so I was sufficiently encouraged to try it out. Rather than having a "flat" for the shed itself I've modelled the first two or three inches of the building and left a gap between the bridge and the shed. It's not too obvious, therefore, that the far right hand shed road doesn't quite align with the shed entrance. The mock up will be covered with Metcalf millstone grit stone card with arches; hence the rather high road surface. It's obvious that there's going to have to be a lot of careful ballasting work done in due course and somehow those slide switches will need to be covered - possibly with huts that move backwards and forwards and are attached to the switch knob. The finished bridge and shed building , together with the tidied up area around the point slide switches. 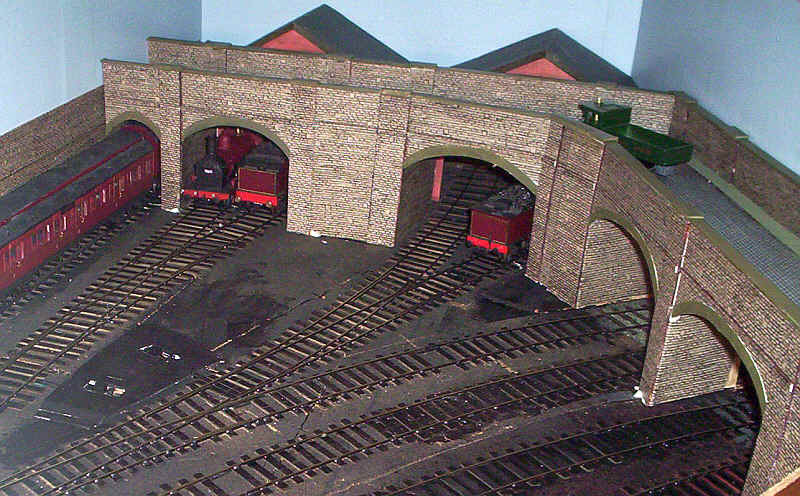 Looking the other way, the enlarged fiddle yard can be seen with the retaining walls more or less finished. At this stage I don't intend to add further details in either of these scenes as the concept is simply to make the fiddle yard area a little more "civilised". However, I'll eventually ballast the track, add a back-scene, some signals and various other details to make it look more realistic. In the meantime "it will do". For some time after I'd built the second level baseboards I'd had a nagging doubt about whether it was as practical as I'd hoped/ imagined. Anyway, to cut a long and boring train of thought short, I've decided that I'm not going to proceed any further with my plans for a BR (LMR) layout. Let's just say that certain physical problems, including a trapped nerve resulting in loss of sensation in my right thumb and forefinger, combine to make the prospect of building another layout at an uncomfortable height unappealing. In addition, my eyesight isn't what it used to be and the thought of building lots of complex locomotive kits no longer has as much appeal. In addition, the limited space I have available, whilst not a problem for small pre-grouping models, looks extremely cramped when the much larger LMS locomotives and rolling stock are placed on the layout. Having made something of a fool of myself (!!!!!!) 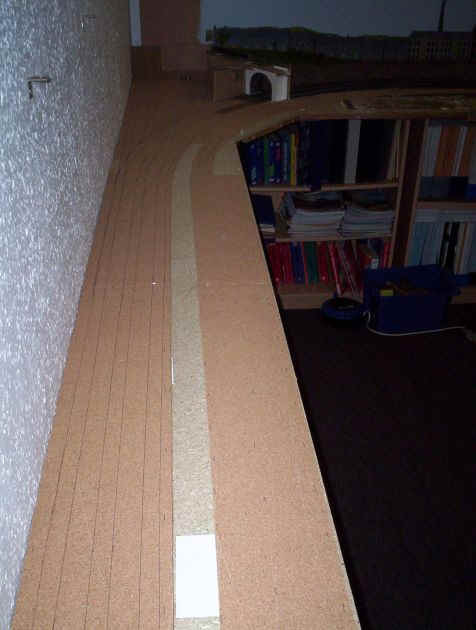 I shall retreat back to my Midland layout and demolish the baseboards. At least I'll be able to see the layout again properly. Looking on the bright side of things, at least the changes to Halifax Midland have made it a much better layout visually and operationally. Well the demolition gang moved in and removed the BR(LMR) layout, which is now consigned to the council rubbish tip. It was a lot of work and rather a salutary experience to realise that it wasn't one of my better ideas. 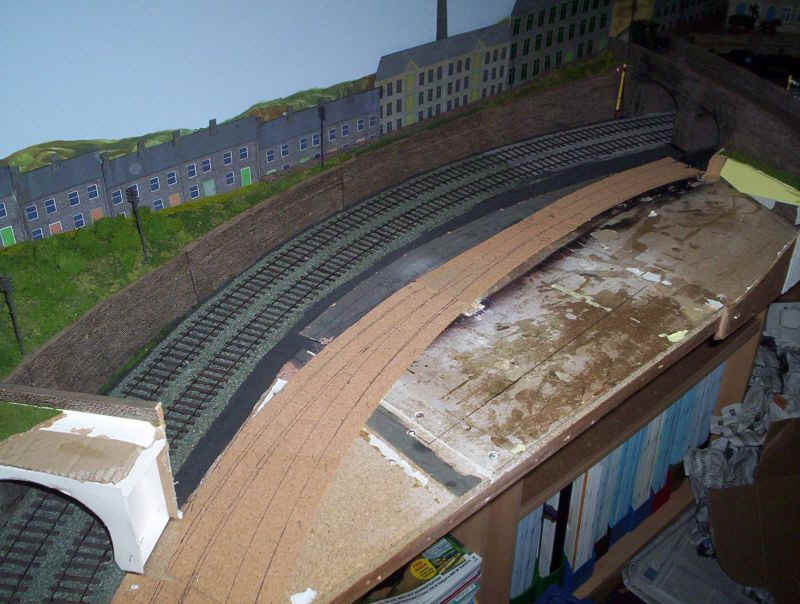 Having removed the top layout boards it immediately struck me that there was no longer any need to separate the storage sidings and loco shed area from the rest of the layout. I removed the board with the mill and tunnel mouths as seen in this photo. The result can be seen in the photo below. 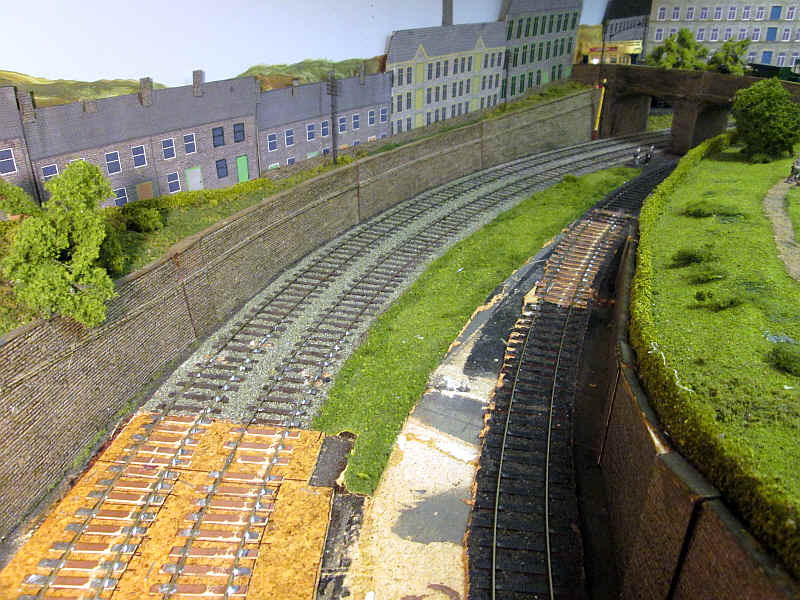 Obviously the road bridge will need to be completed on both sides and retaining walls and scenery will need to be added, but initial my feeling is that it makes the layout seem much larger and opens up greater operational possibilities for shunting freight stock. The one drawback is that the Midland railway would never have allowed a facing point directly into a loco shed or carriage siding off a main passenger line. However, in the space I have there is no alternative solution so I'm going to live with this discrepancy. The three photos above show "progress" to the end of October 2010. The whole of the old fiddle yard area has now been ballasted by laboriously painting PVA adhesive between every sleeper and sprinkling Woodlands scenics stone or ash ballast onto the PVA. When this is set dilute PVA is trickled over the ballast to secure it firmly. 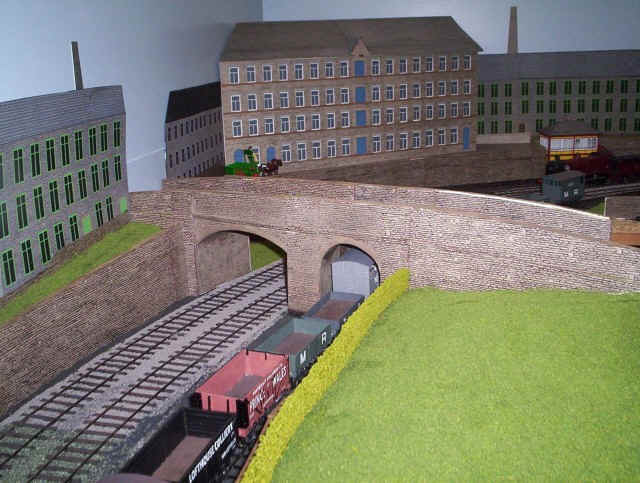 The bridge has been rebuilt as a double sided one, whilst retaining walls stretch the entire length of the fiddle yard, ending in another bridge, this time one with a girder instead of an arch. At first glance the two rear tracks look like a double track main line but only one line continues beyond the bridge. At present I'm contemplating some sort of removable track at the end of this section - it could be a vertical lift with several tracks or a cassette storage system. There's obviously a lot to do scenically but already I feel I've made the correct decision to bring the fiddle yard into the scenic area of the layout. Progress has been slower than I expected due to other interests in my life taking precedence over model making. However, as several more 0-6-0s have appeared on the scene (built from odd bits of Alan Gibson etchings) it has become obvious that the layout needed some extensions. The first step was to widen the baseboard in front of the storage sidings to give me space to have two sidings holding two locomotive each. Of course this meant I'd now lost one of the sidings that could be used for wagons. In addition to this it continued to irritate me that, whilst passenger trains could disappear off stage into the "fiddle track" beyond the bridge freight wagons were condemned to stay on stage all the time. Eventually I decided to have two off stage "fiddle tracks" and widen the board at the end by a couple of inches. 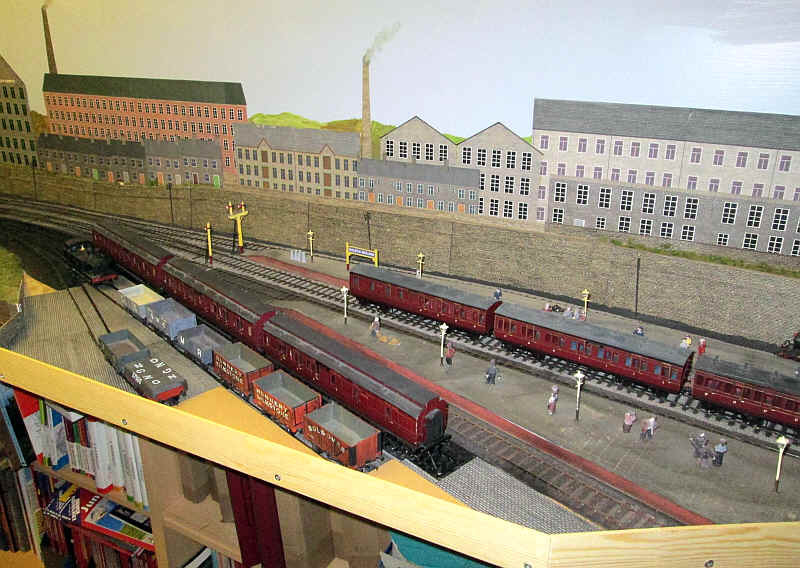 The new Halifax Midland sorting sidings and locomotive holding sidings. The double track main line at the rear is operated a separate passenger (at rear) and freight (at front) lines with wrong road operation. However, at least the trains all go somewhere off stage now. A local train is passing Halifax Midland shed. 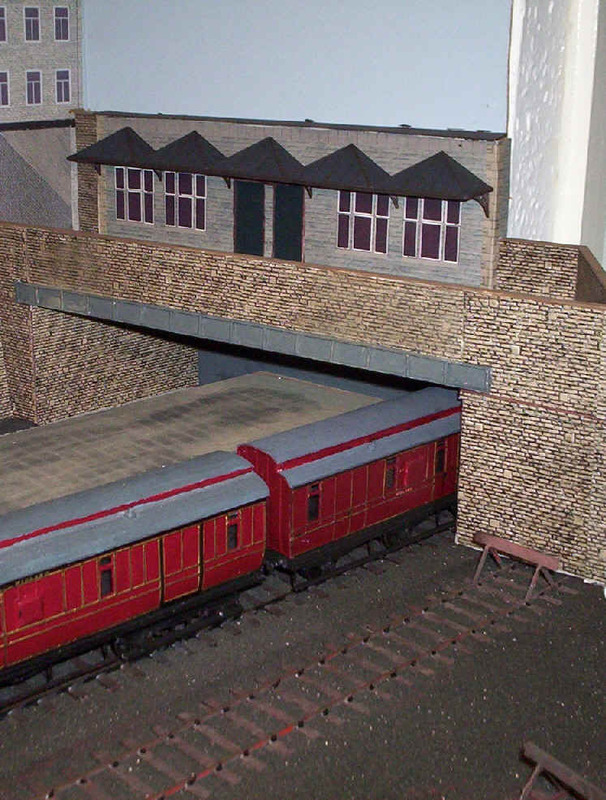 The road bridge conceals the fact that only the first couple of inches of the shed building is modelled. Usually only passenger engines use the shed building. It still annoys me that the approach to the shed is directly off the main line - this is something I will deal with if the layout is ever totally rebuilt. Whether the signal box is in the correct place at this end of the layout I'm not sure but it was the only place I could find to fit it in which didn't get in the way of the slide switches used to operate the points. It's built from another etched kit which came to me minus windows and various other parts and was terribly badly assembled. New windows were fabricated from thin strips of self adhesive labels stuck onto clear plastic. The window frames were drawn on to the label and then carefully cut so that the panes could be peeled away. Viewed from the other side of the bridge the half relief nature of the shed building is obvious. A track level view of the fiddle tracks reveal the unpalatable truth about the track in this area - however it all works without derailments. Readers of this blog will know that predicting the future of Halifax Midland is difficult. But I feel I should make some observations at this point because I think this is as far as I can take the project in its present form. The layout doesn't really meet the standards that I'd like anymore. Whilst I'm still reasonably happy with the rolling stock and motive power I feel that many aspects of the track layout are wrong. 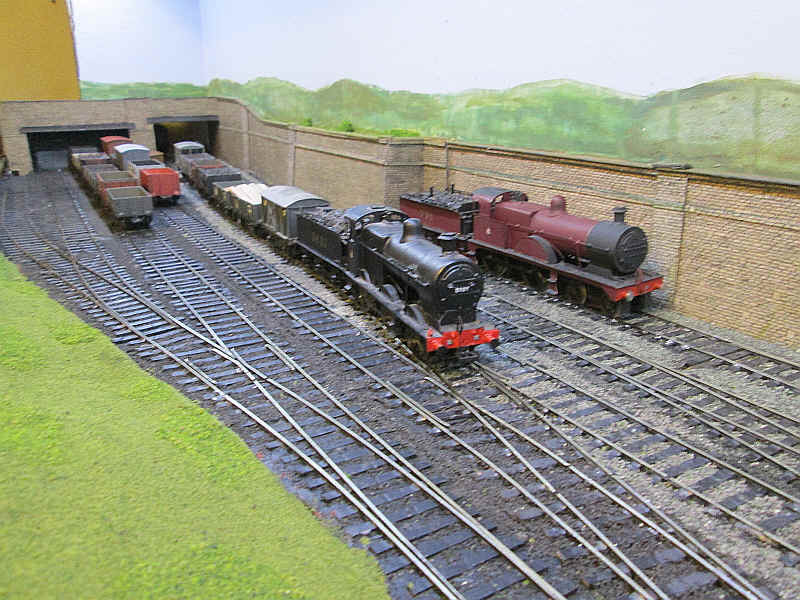 Given the constraints of the size of the room, and my desire to have a layout with a mainline feel to it, there are only a small number of changes that are possible and practical. The main one of these concerns the locomotive shed. This really needs to be approached from a trailing spur from the main line. The Midland (and no other railway for that matter) would have tolerated my layout. 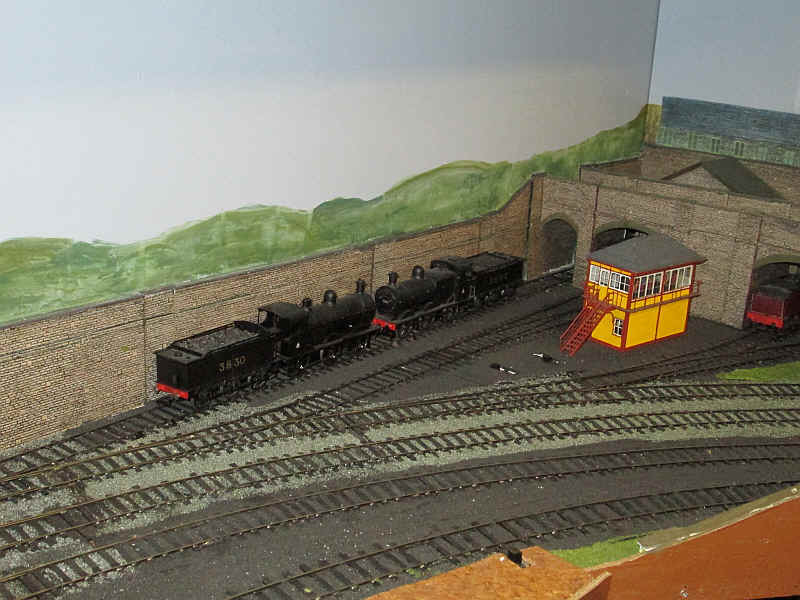 However, the reason for this was that when first built the shed area was part of a non scenic fiddle yard, which was then given the scenic treatment to make it look more attractive. 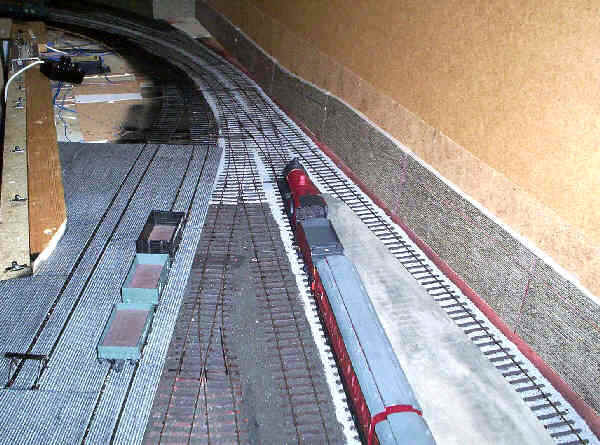 However, the latest change, with the addition of the two fiddle tracks, means that the whole layout is now effectively 'real' and running straight into the shed off the main line won't do. Really the only answer is to rebuild the whole layout at this end. 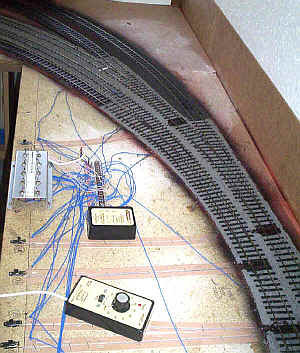 This will mean that the radius of the main line will needed to be slightly reduced to give space for a shed head shunt. Another aspect of the layout I no longer feel is acceptable is the use of the Metcalfe Models printed stone card. Yes, it is easy to assemble but it doesn't lend itself to weathering and complex retaining walls in the way embossed plasticard does. Similarly, the computer generated buildings on the back scene don't look right either. And finally, we come to the track. This really needs replacing with track of a more scale appearance. Ideally I'd use the new SSMRS plastic chair system but there is no possibility of me having any pleasure trying to thread thousands of chairs on the rails, given my relatively poor eyesight. 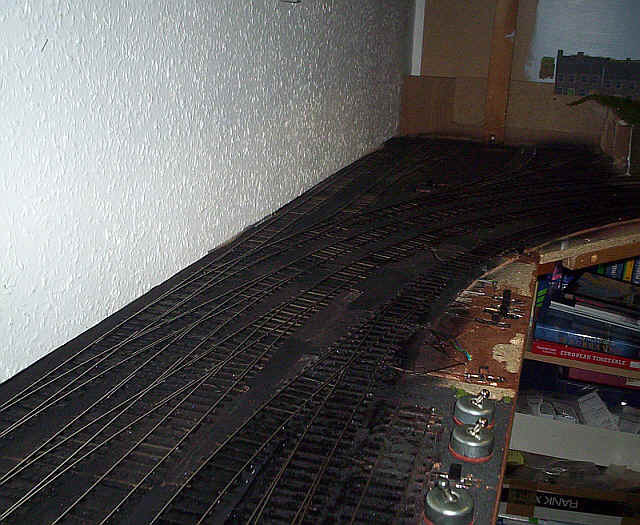 So this will have to be Code 95 rail and copper clad sleepers, of which I have an enormous quantity. When will all this happen.....? Perhaps not surprisingly my doubts as mentioned above led to no action being taken for some considerable time. 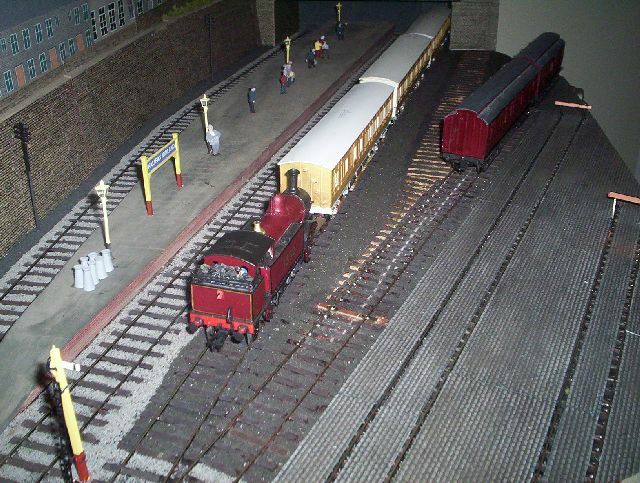 In fact almost a year has passed since I did any significant S Scale modelling. However, a period of reflection can often throw up new ideas. 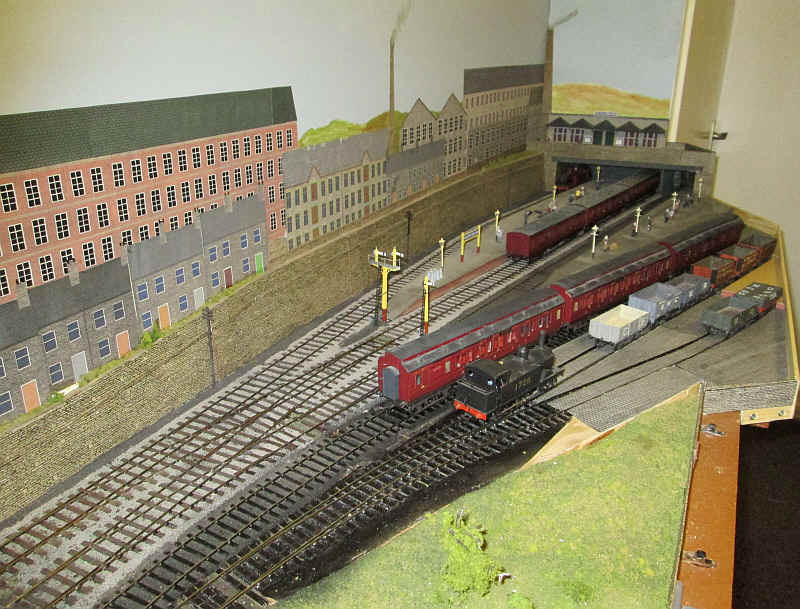 Whilst there are numerous faults with the layout and things I'd like to change: better looking track, embossed plasticard rather than printed card, a better entrance to the locomotive shed and so on Halifax Midland was my first S Scale layout. I have great affection for it and have enjoyed adapting it from its very basic beginnings. 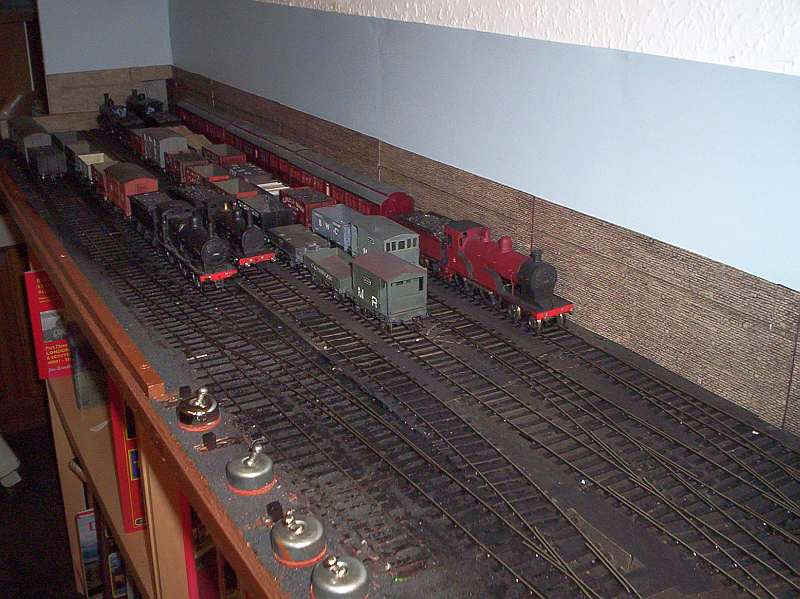 So at the beginning of 2013 I started on another round of minor changes all of which, when taken together, make it a more enjoyable layout to operate. 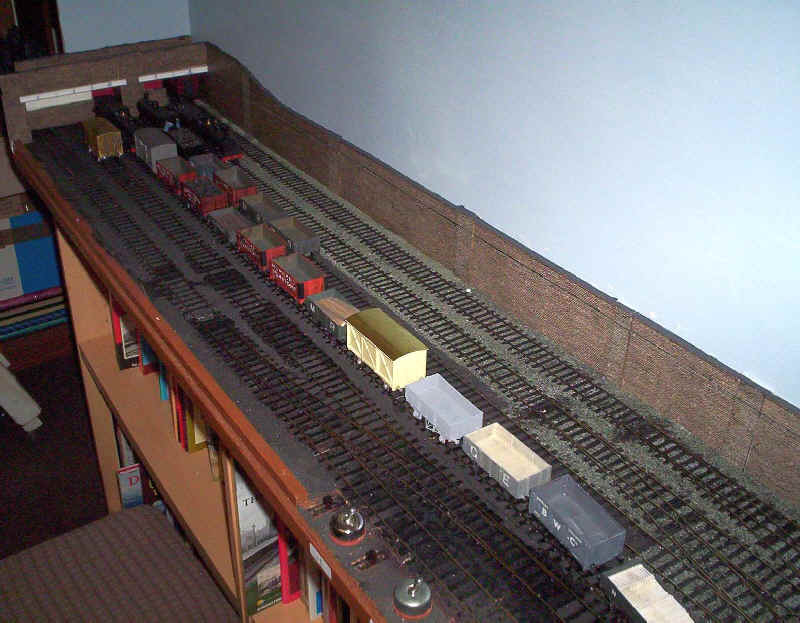 The first change was to the two track fiddle yard. The addition of a drop down shelf in front of the fiddle yard, together with a shelf above for spare rolling stock, now mean I have good access to this part of the layout. Because I can now easily reach and safely remove stock it's possible to have a distinct arrival and departure line in the fiddle yard. This means that, for the first time, I can now have trains leaving and arriving 'right road' rather than the unsatisfactory compromise I had before of a road for goods and one for passenger trains. 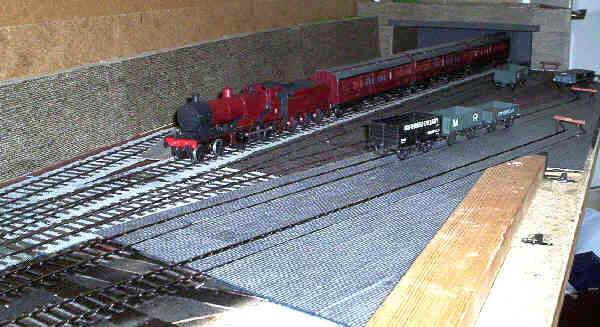 To aid re-railing stock I've built an S Scale re-railing ramp from plasticard similar to the one made by Peco. It can be seen lying on the shelf next to the carriage. A knock on effect of having a shelf for storage of rolling stock is that I can now use the former carriage siding at the rear of the engine shed to store my freight locomotives. This has been divided into three sections so the shed can now hold seven locomotives - four in the shed building and three in the open siding. Now that the goods engines can be stored in the shed area this also means that the sorting sidings are now available exclusively for goods wagons. In fact there is space for about 45 wagons if needed. 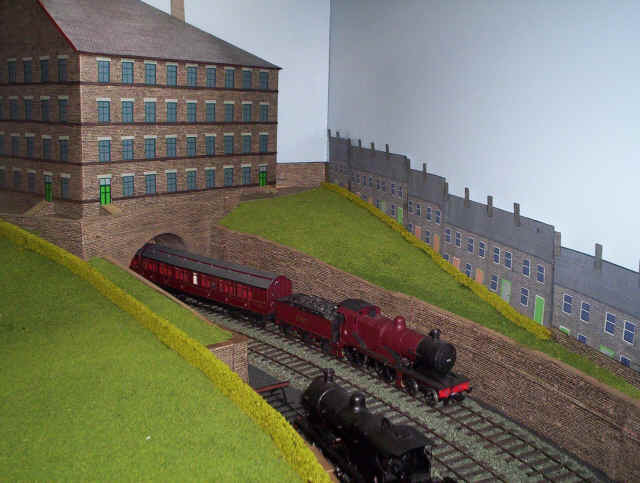 Moving to the station area of Halifax Midland I decided that the small goods yard could usefully be altered. The original long siding is now used as a carriage storage line whilst I've widened the baseboard by about two inches thus allowing two fairly short sidings to be located here, both ending in end loading ramps as well as having cobbles/ setts. They sidings accessed by another of those horrendously tight 36inch/ 60 inch curved points. Amazingly, both my MR 0-6-0Ts and all the rolling stock happily run through these. Obviously, there is more scenic work needed but I particularly like the way these changes have given the station a more important appearance - there are now seven tracks across the full width of the station. One of the features of Halifax Midland that I really dislike concerns the access to the locomotive shed. 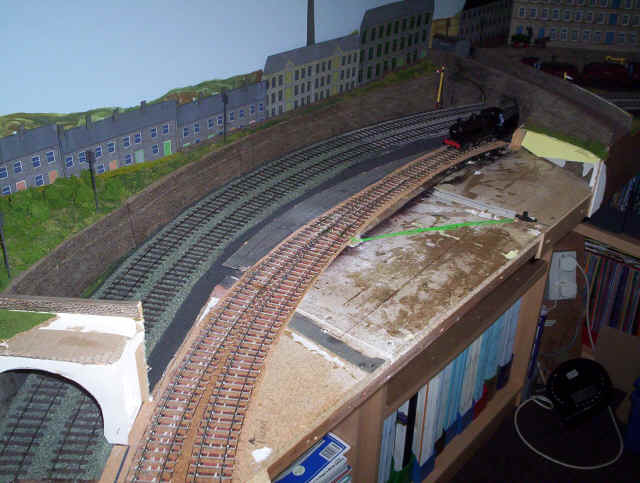 Because this side of the layout was originally a fiddle yard, I'd simply run the shed roads directly off the main line approach to the station. This meant that there were three facing points that main line trains had to negotiate. Amazingly, I never actually manage to run an express into the shed but the Midland Railway (or the Board of Trade Railway Inspectorate) would never have allowed this in real life. I thought for a long time how to overcome this but all solutions meant that the radii of the double track would need to be tightened slightly by about three inches. I felt that this might be pushing tolerances too far but some experiments showed that it would be possible without compromising reliability of running. 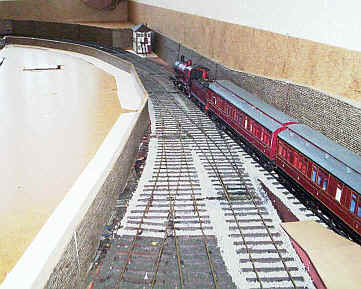 The solution was to slew the two approach lines from the fiddle yard as in the photo below. 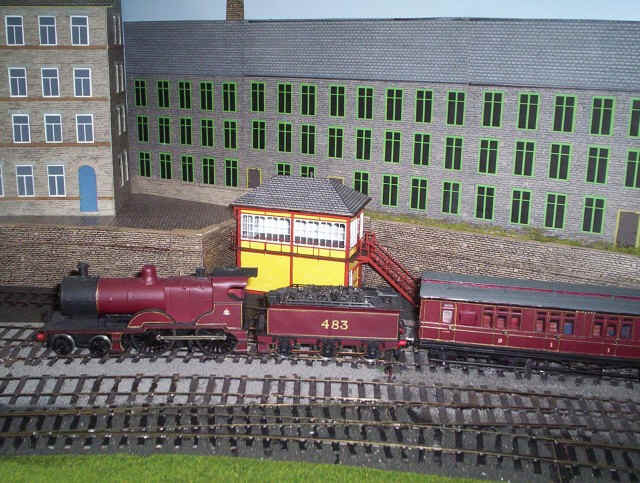 This now gave a trailing crossover from the station approach mainline to a short head shunt leading to the locomotive shed - where the 4-4-0 is standing. A new crossover from the departure line will give access to the goods lines. This means that freight trains will have to leave the fiddle yard working wrong road. I've imagined that there is a crossover beyond the bridge where trains would cross over from the Down (towards Halifax) to the Up (towards the rest of the MR system). The third track away from the retaining wall was originally the goods approach line but is now the Up main line. Looking in the opposite direction the short length of new track was where originally the Down line continued under the bridge. The two main lines passing under the bridge are the new slightly sharp curves. Moving beyond the bridge towards Halifax Midland the new curves join on to the existing Up and Down main lines. The curve point on the goods lines has been removed and replaced by plain track. All is now wired up and operational - ballasting will follow after extensive test running in case I need to do any tweaking of the track. The plan after this is to undertake a heavy refreshing of the scenery over the entire layout. The revised approach to the station. The empty formation of the original goods line can be seen in the centre of the photo, whilst the new plain track section is where the point to this used to be. The through Halifax Midland to St. Pancras portion of a service from Leeds begins its journey behind a Compound. 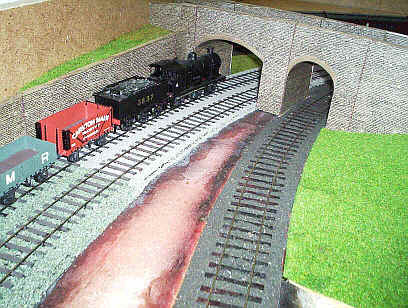 Behind is the bridge which hides the entrance to the four track loco shed. The rear track with the 4F on it is supposed to continue to an off-stage turntable and coaling stage. Sadly, I haven't found a way of having either in reality without expanding the baseboards beyond what is physically possible. A freight train arrives and is crossing over from the Up main line on to the goods line. The 700 class 4-4-0 is standing on the new loco shed head shunt. The main line now has a gentle 'S' curve as can be seen from the flow of the wagons. Looking down the length of layout the improved appearance of this part of the layout can be seen. I'm pleased how the retaining wall on the left, which has been built out from its original position looks more natural now that the shed area's retaining wall appears "recessed". The next stage of development of this side of the layout will be installing some signals and general clutter to bring it to life. The back scene also needs some work on it with more signs of industry and habitation. Operation now feels much more realistic although I still wish I had a more spacious fiddle yard! 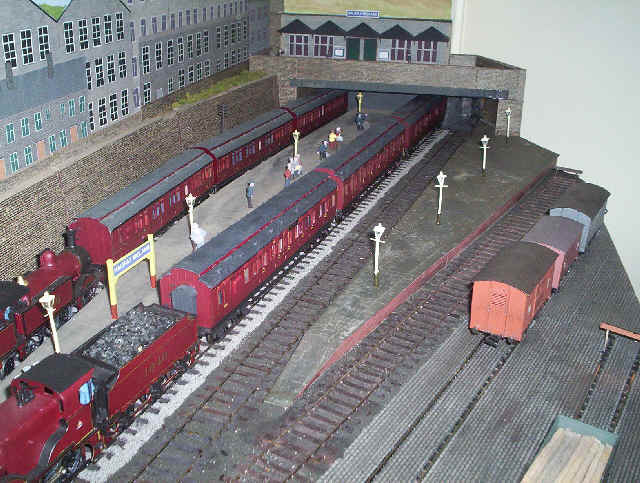 The access to the fiddle yard on Halifax Midland has always been a problem as it has been too short to allow locomotives to be placed on the track easily, especially with the longer express coaches. I eventually decided that something would have to be done and this is the result. I've shortened the length of the sidings by about two and a half wagon lengths and removed the short fourth siding at the front. The tracks disappear under a road bridge as before but the ends of the track are concealed under a cardboard box. This and the baseboard surface have been varnished to give a neat finish. The view of the sidings from the scenic end. each siding can hold six or seven wagons, which equates to about the maximum length of freight trains that can be handled in the fiddle yard. The signal gantry has been reduced in height and whilst it really is too close to the bridge is the closest it can be because of the tight clearances between the main line and sidings. 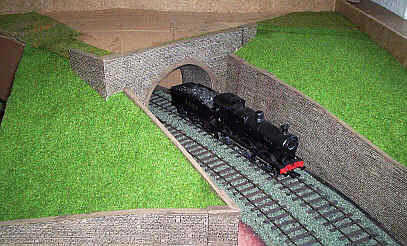 Compromises are necessary when trying to model a mainline in S Scale in a small space. Initial operations with the new arrangement are that it is a much more positive experience so perhaps now is the time to write that sequence timetable I've been promising my self to do.